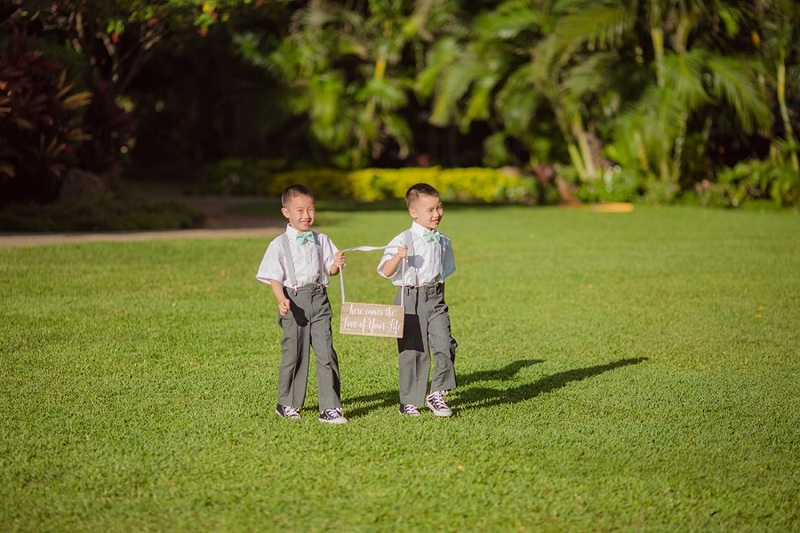 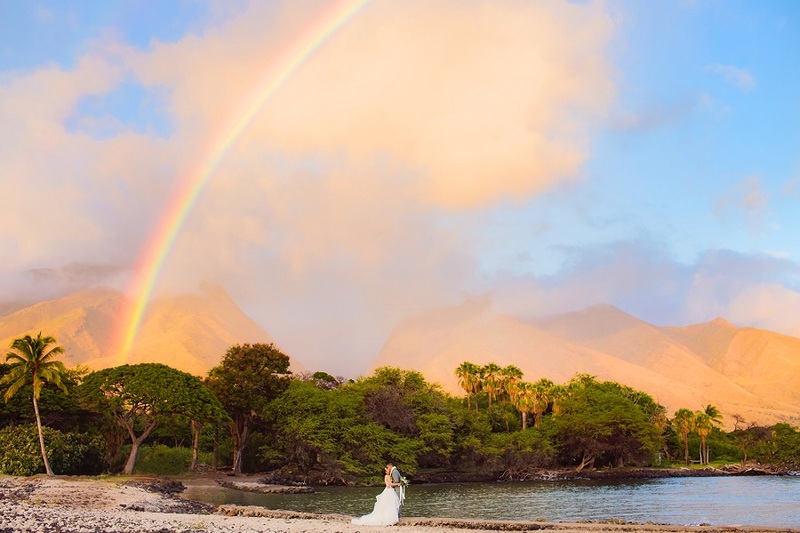 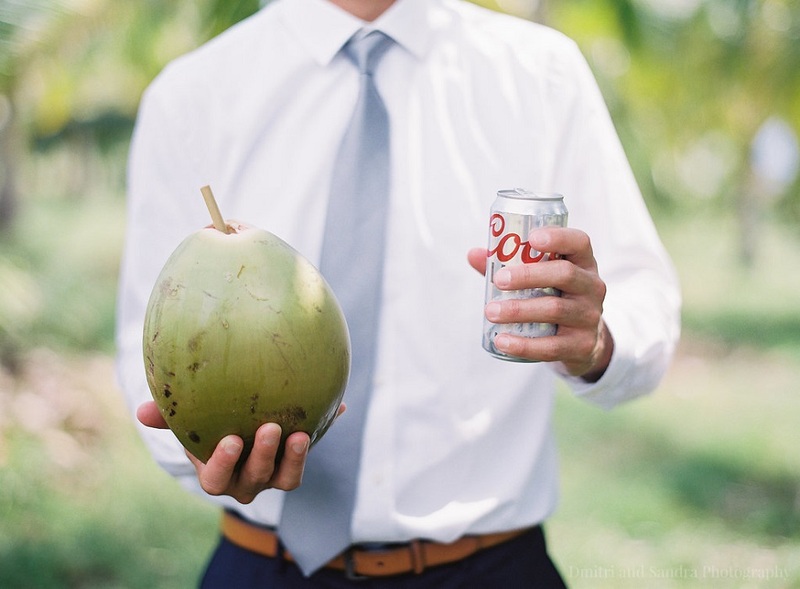 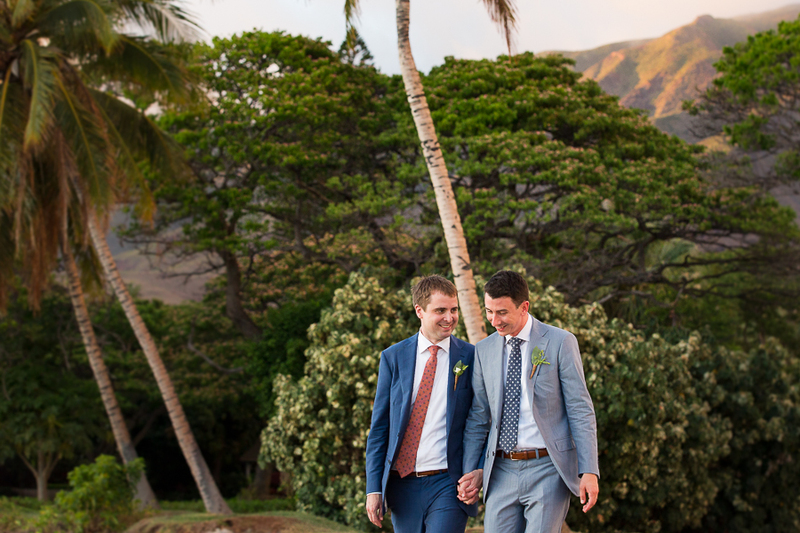 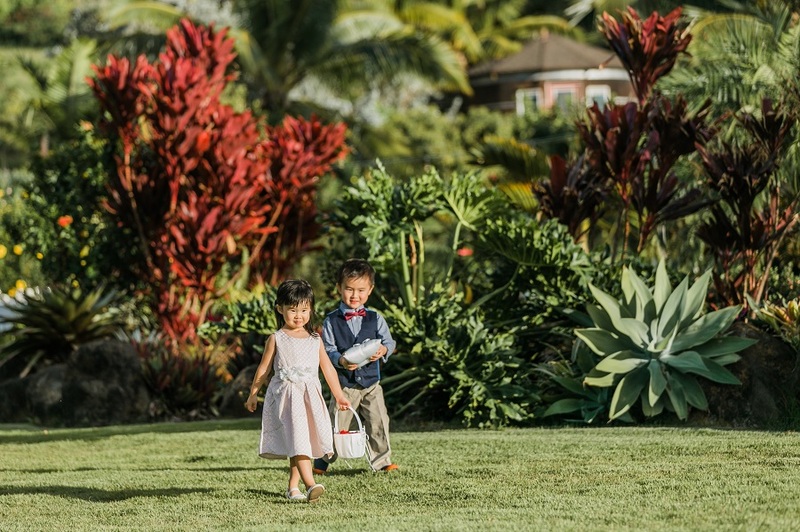 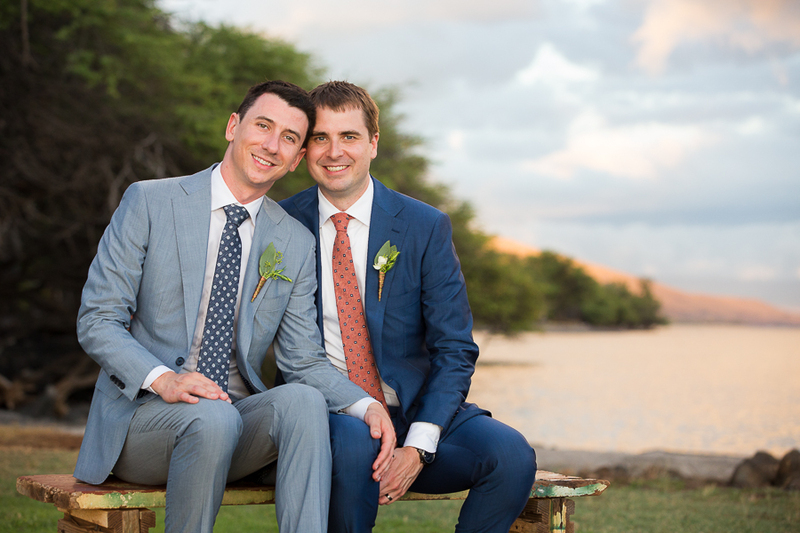 Jim and Josh held their wedding at the stunning Olowalu Plantation House on the sparkling shores of Maui. 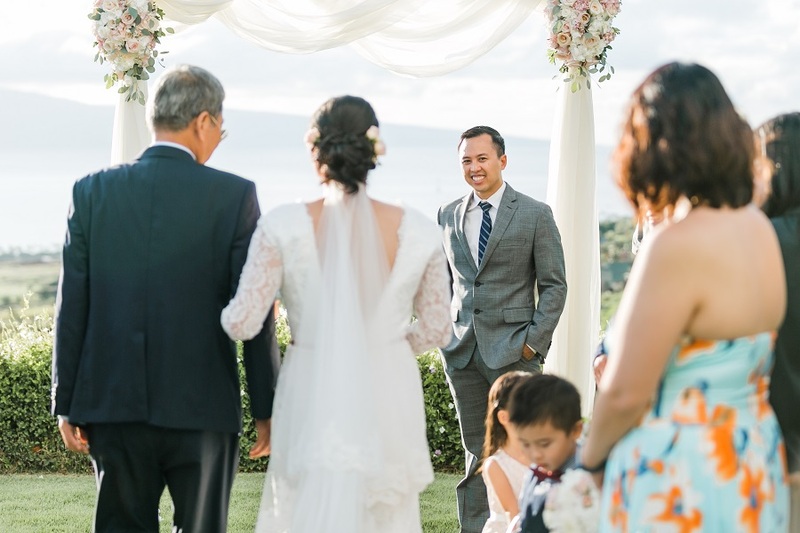 Friends and family raved about the beauty of the location they chose for their sweet ceremony by the sea. 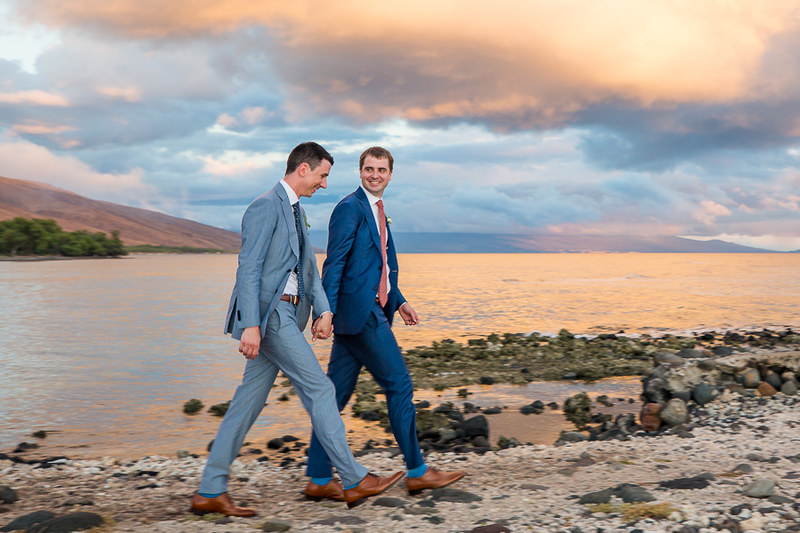 As the sun set over the island, the couple was able to enjoy a stroll down the pier together before rejoining the celebration under the twinkling bistro lights. 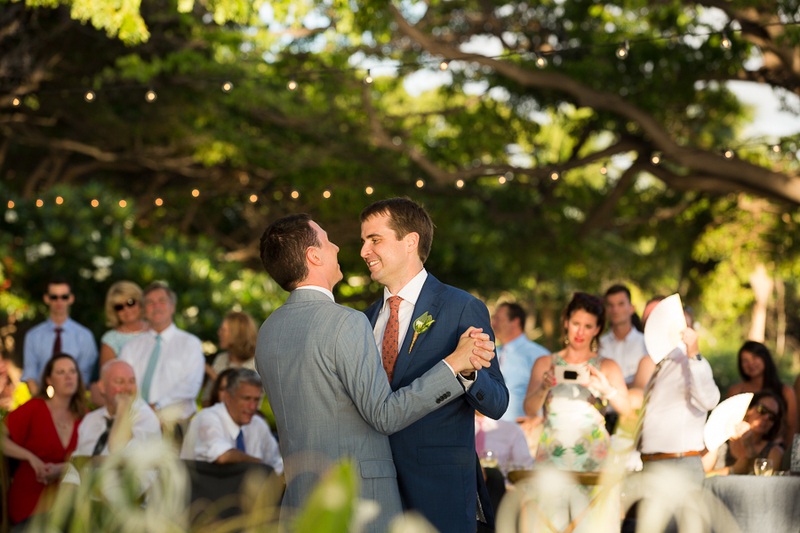 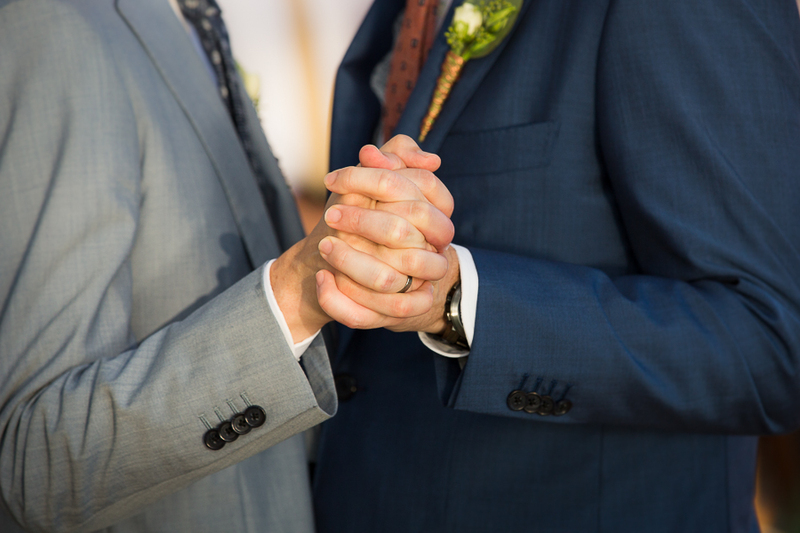 What a beautiful wedding, we were so happy to be a part of this wonderful couples “I dos!” Congratulations Jim and Josh! 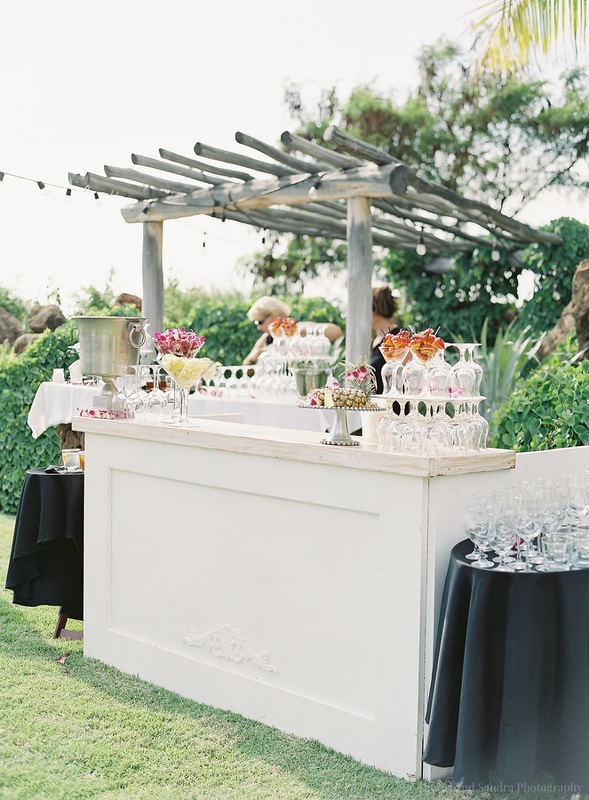 A special thank you to all of the vendors who assisted in making this such a beautiful event! 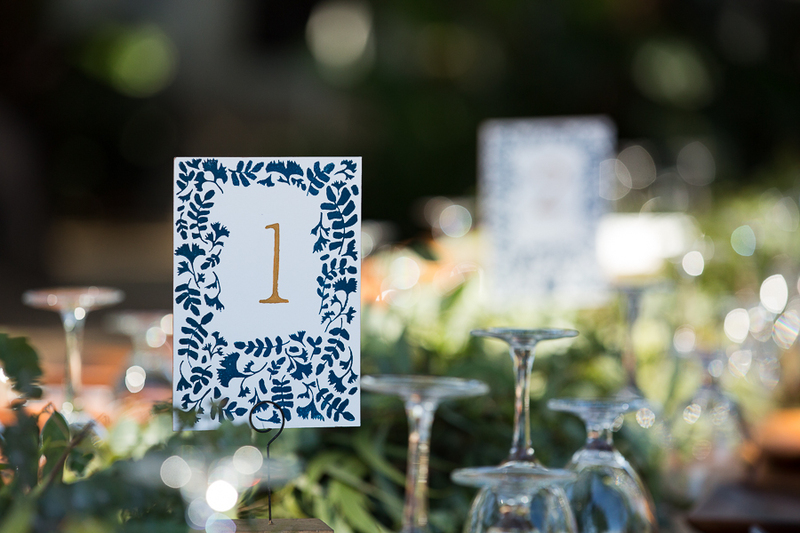 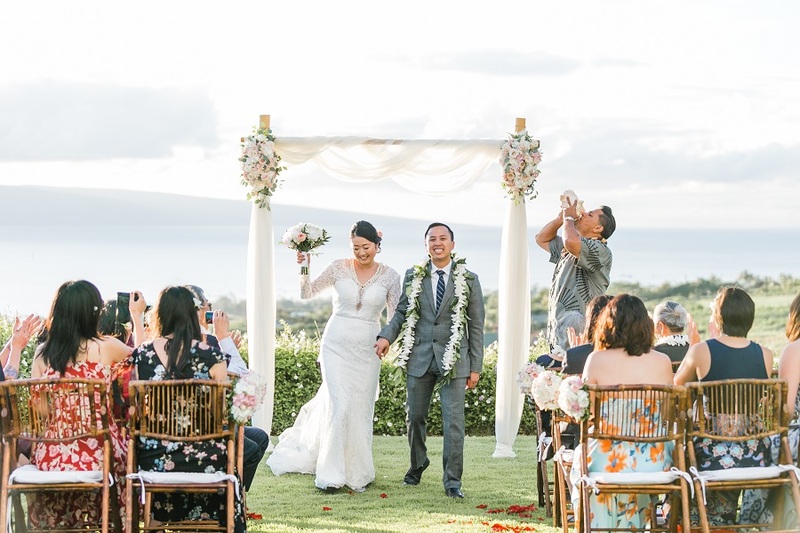 And to their friends, Ivy Pak, who served as the officiant, and Niki Baker who designed the invitations and table numbers. 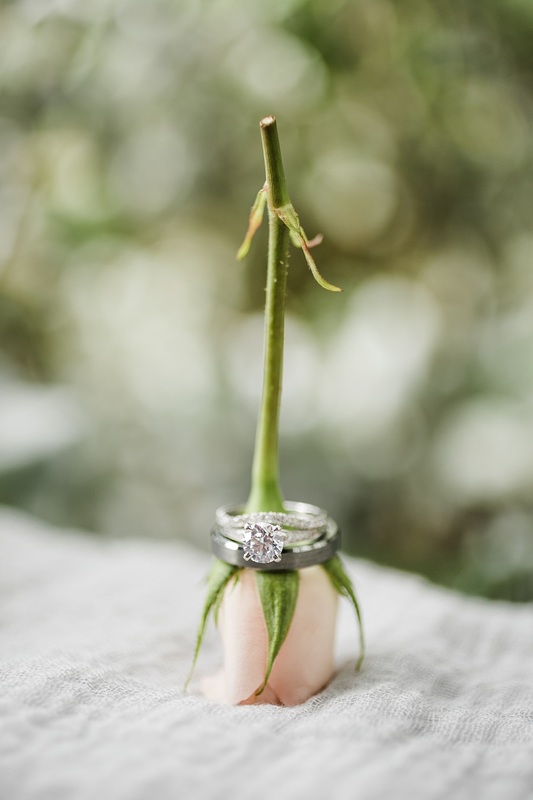 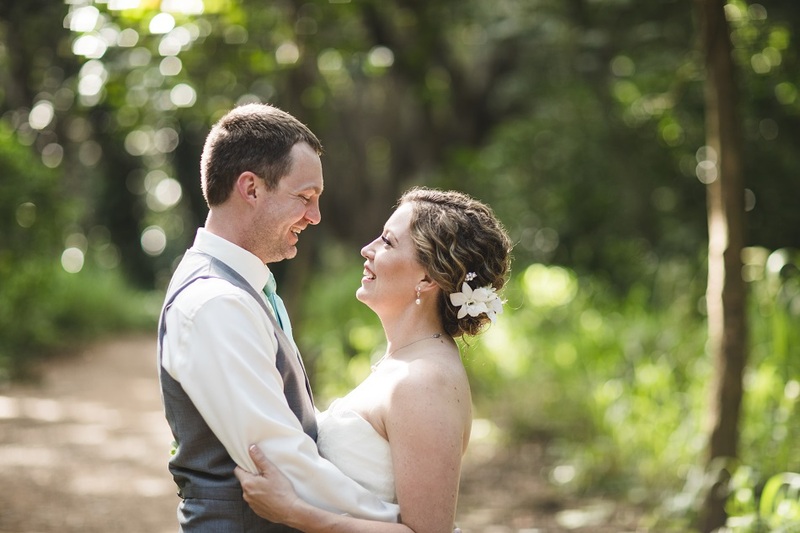 If you are ready to fall in LOVE, take a peak into the ceremony and reception of Michelle and Kellen! 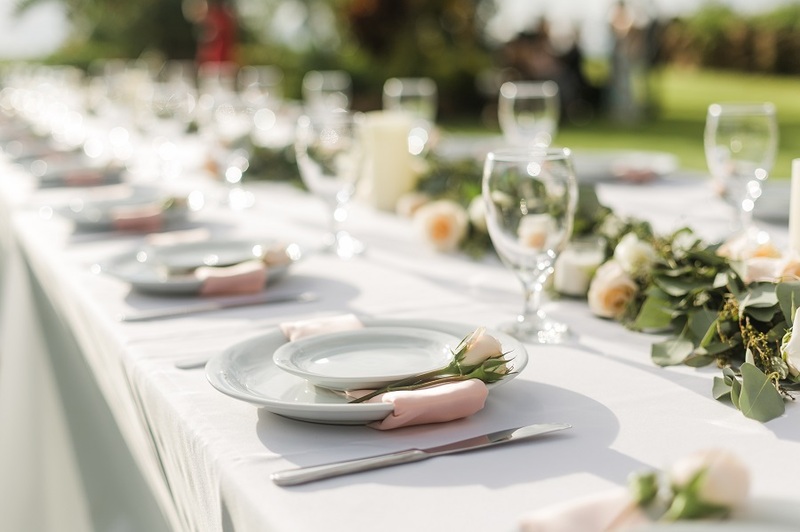 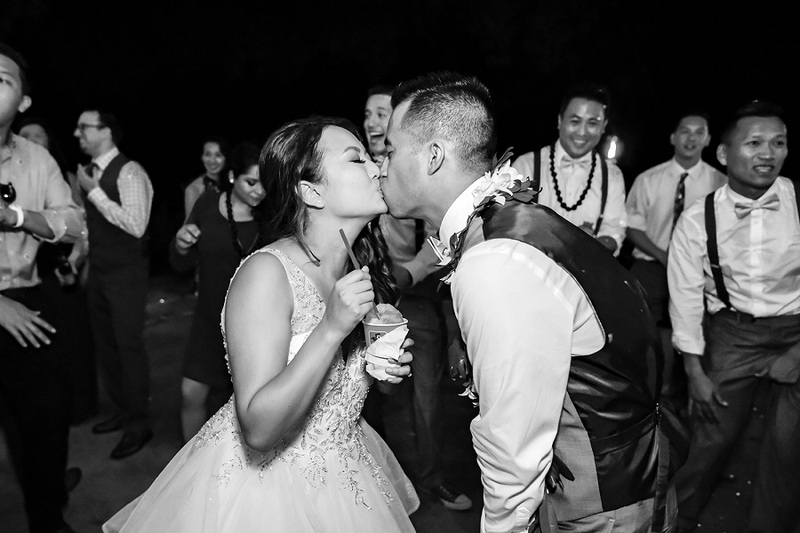 As a private chef and past winner of Cut Throat Kitchen, Kellen knows how to win, and lucky enough, he has won the heart of his beautiful bride, Michelle. 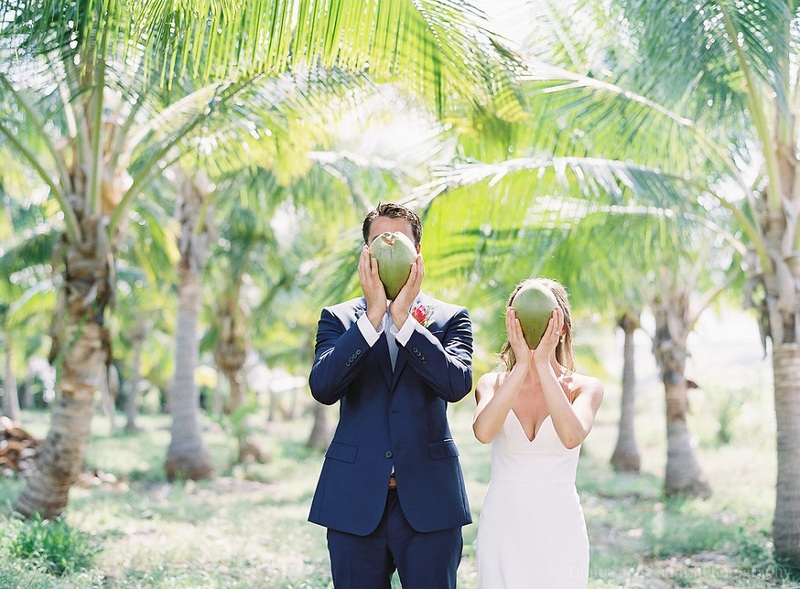 We just adore this fun-loving couple! 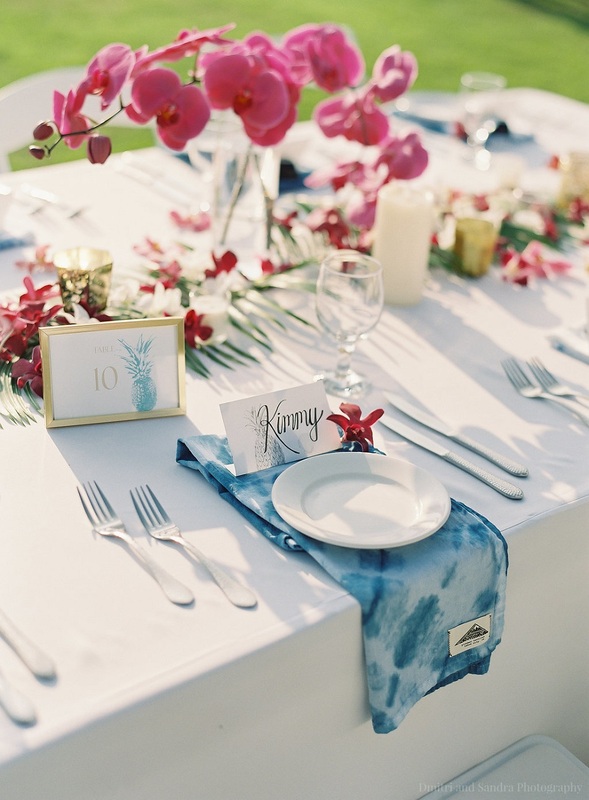 Hand-made tie-dye napkins and dainty porcelain sake cups (used for a sake toast, as a nod to their heritage) were thoughtful favors their guests were able to take home as a token of this oh-so-special day. 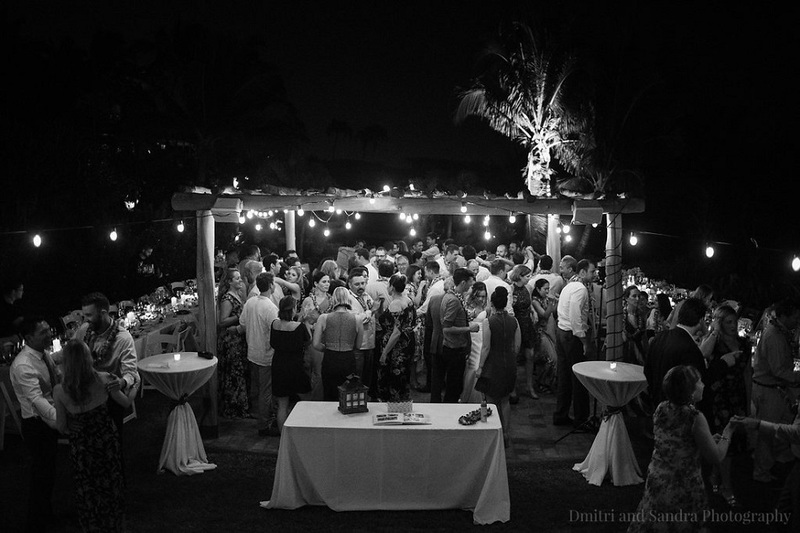 Once the reception kicked off and the music started, there was no stopping! 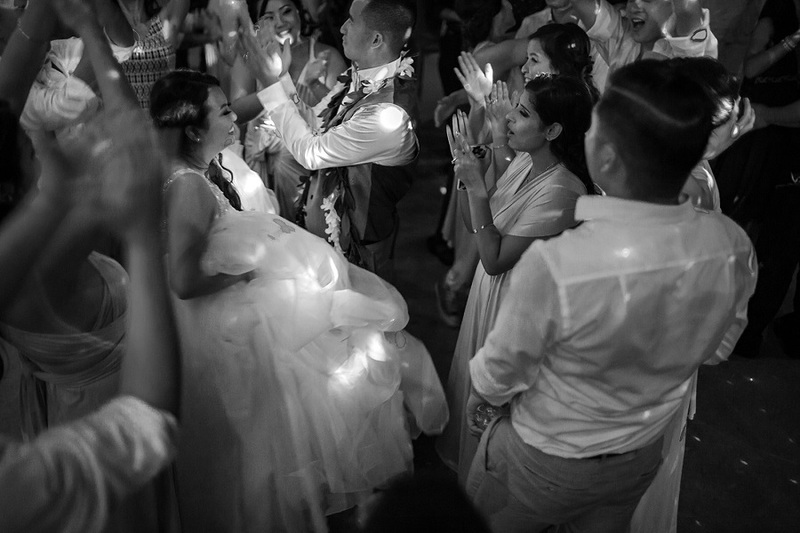 They danced and danced as the full moon rose over the mountains and shone down on couple, surrounded by friends, family, and most of all…love. 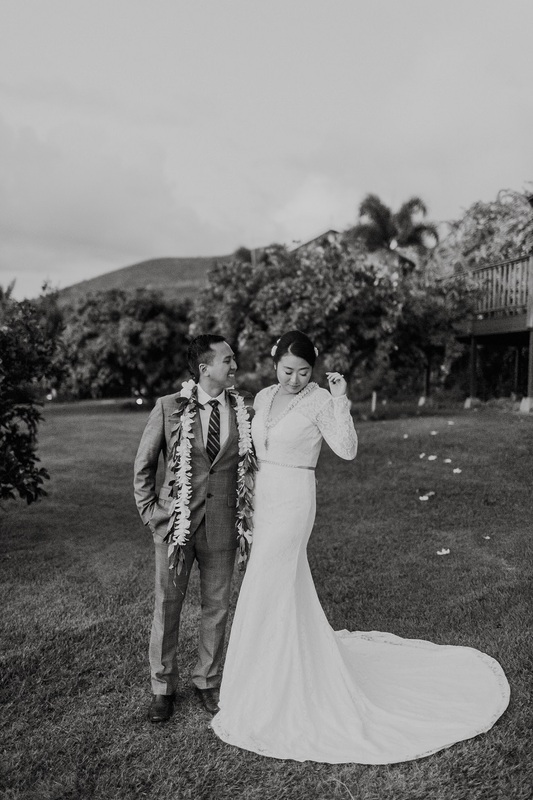 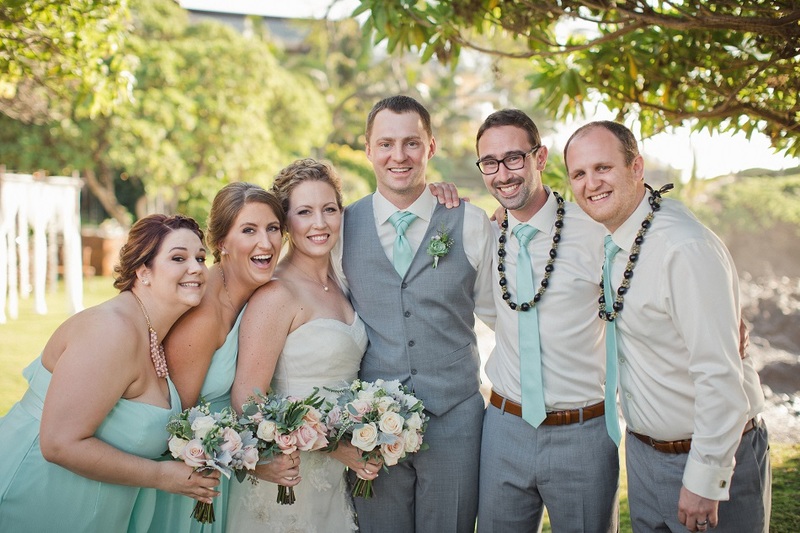 Smiles and laughter flourished at Katie and Joe’s fun-filled island wedding at the historical Olowalu Plantation House. 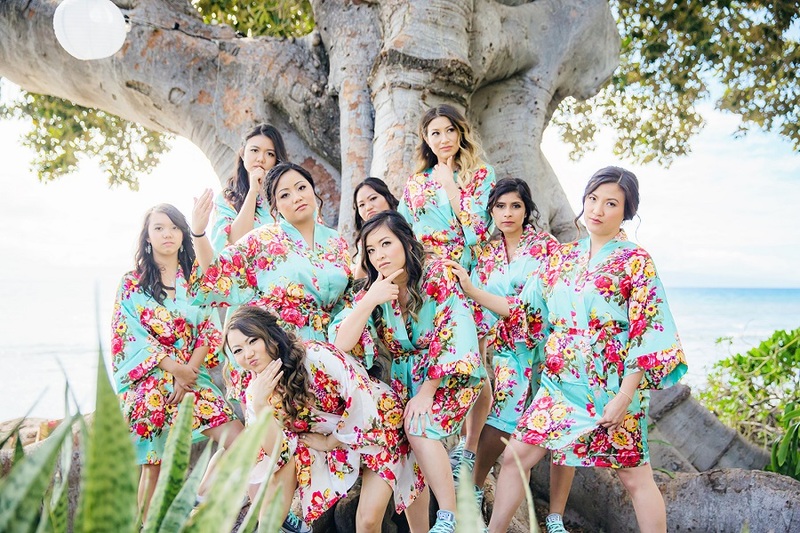 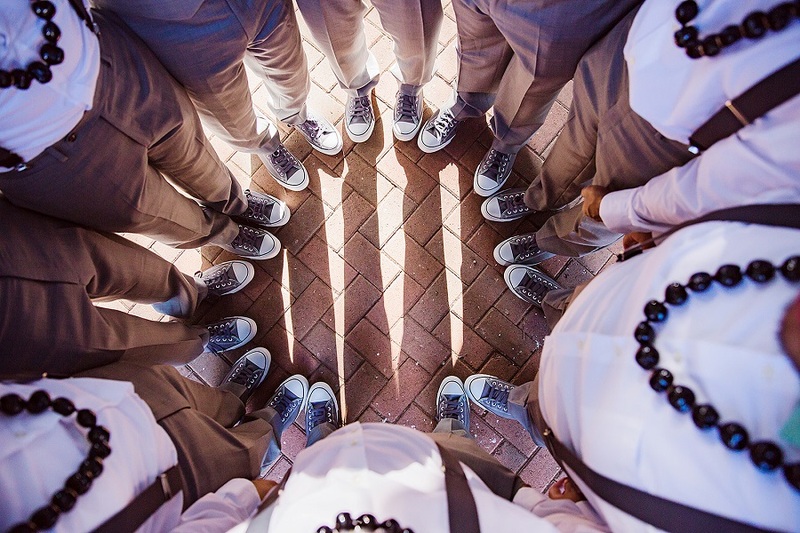 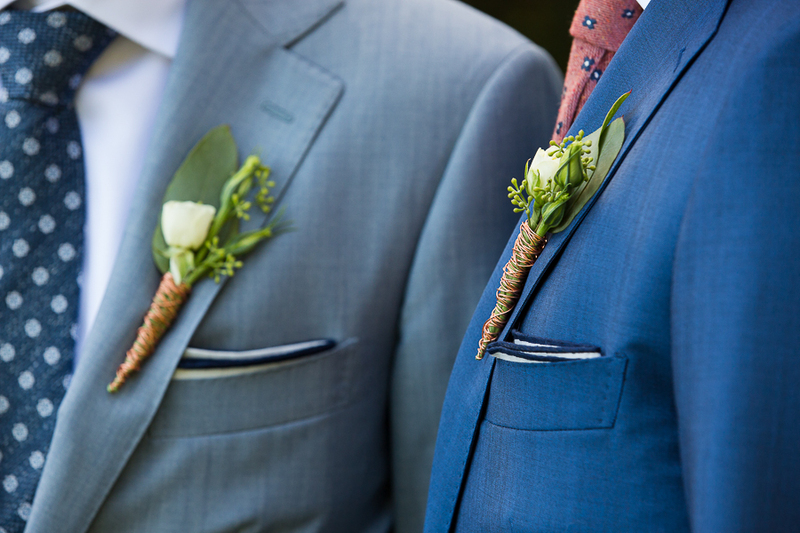 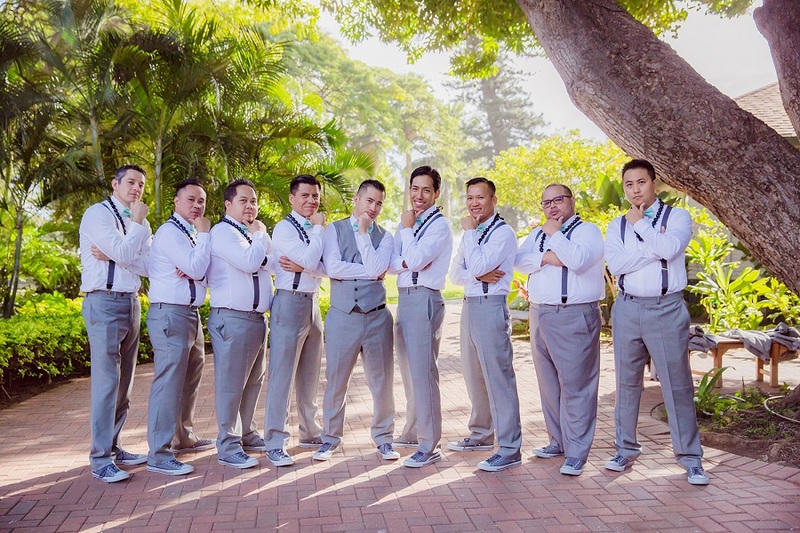 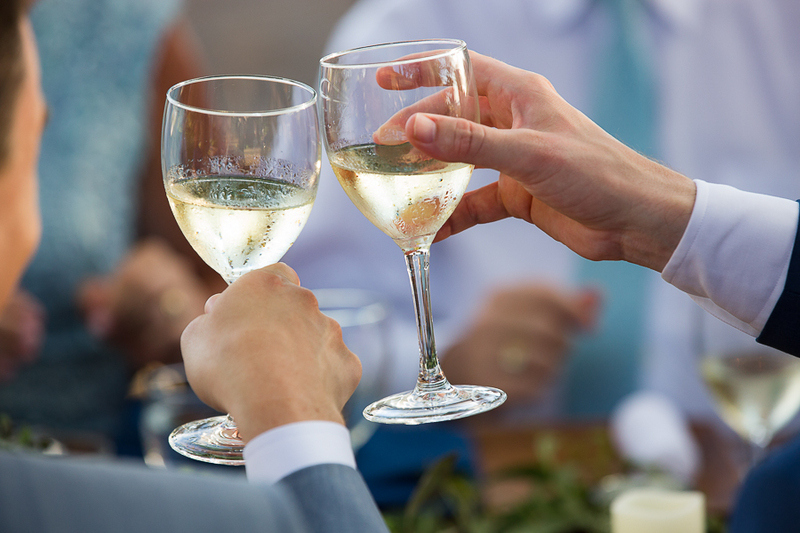 With an “All-Star” cast of bridesmaids and groomsmen, no detail was overlooked in their quest to say “I do” in style. 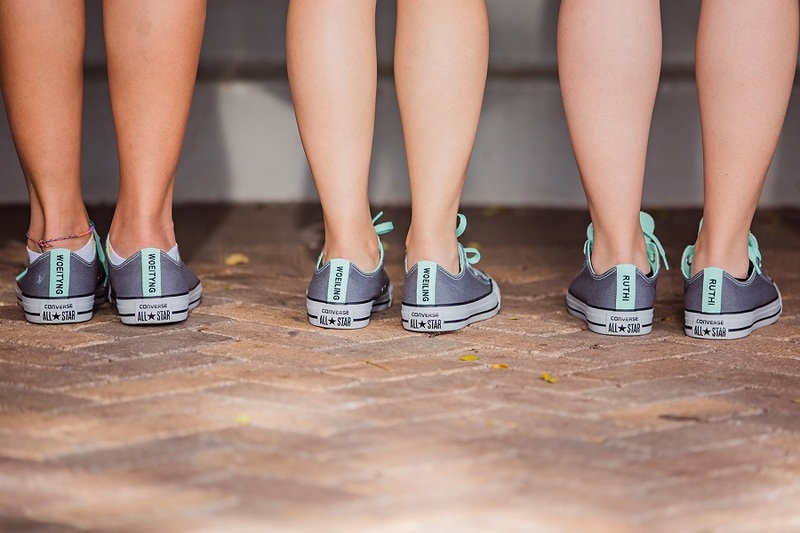 (Take note of the customized Converse tennis shoes!) 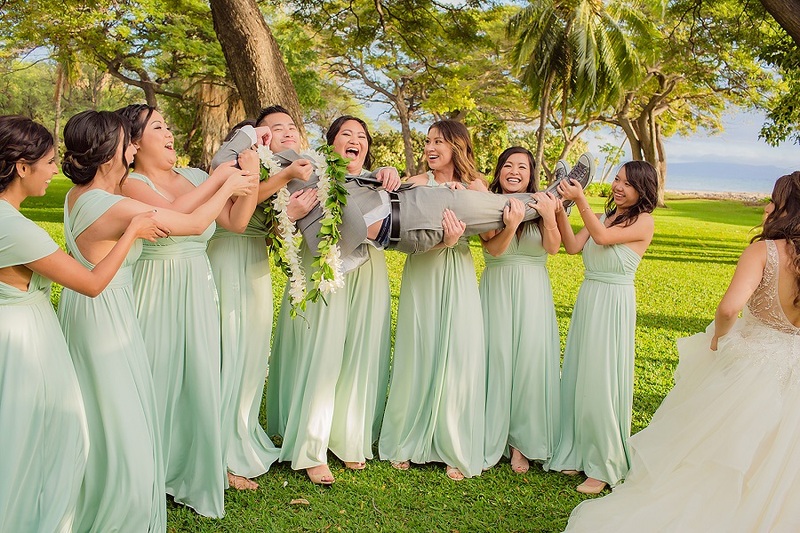 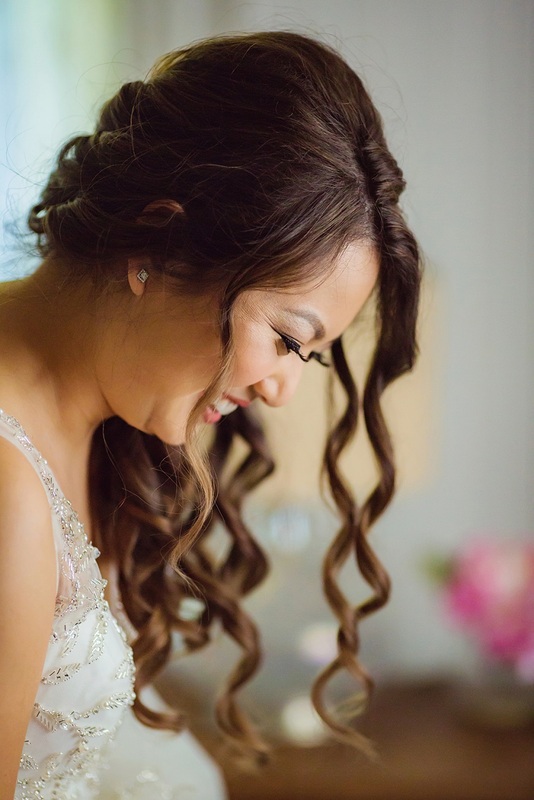 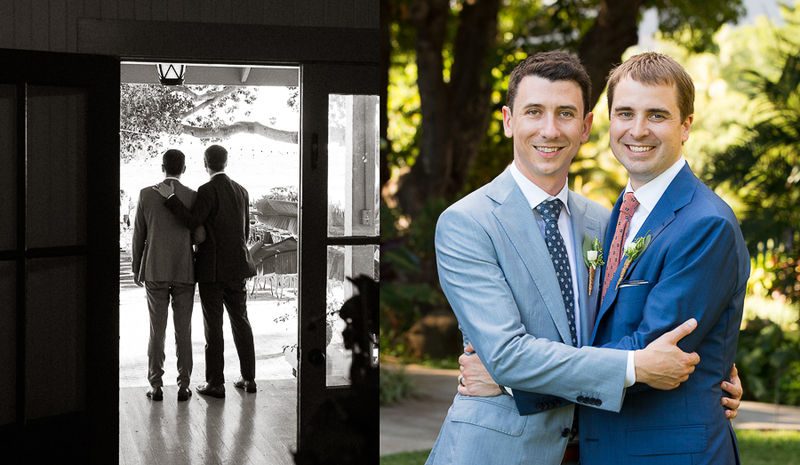 Friends, food, and fun were abundant, and you can practically hear the cheers and laughter when sorting through these beautiful and smile-worthy photos. 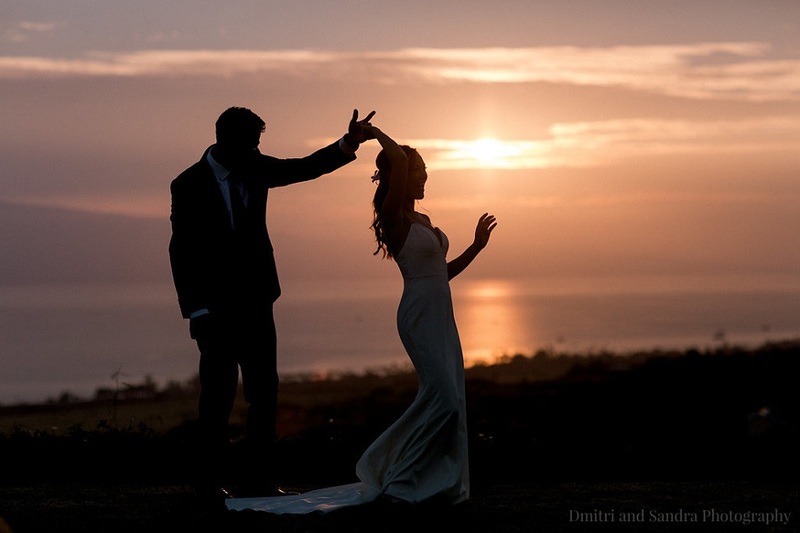 Once the sun finally sank beyond the horizon, it was time to break in those Converse and dance the night away. 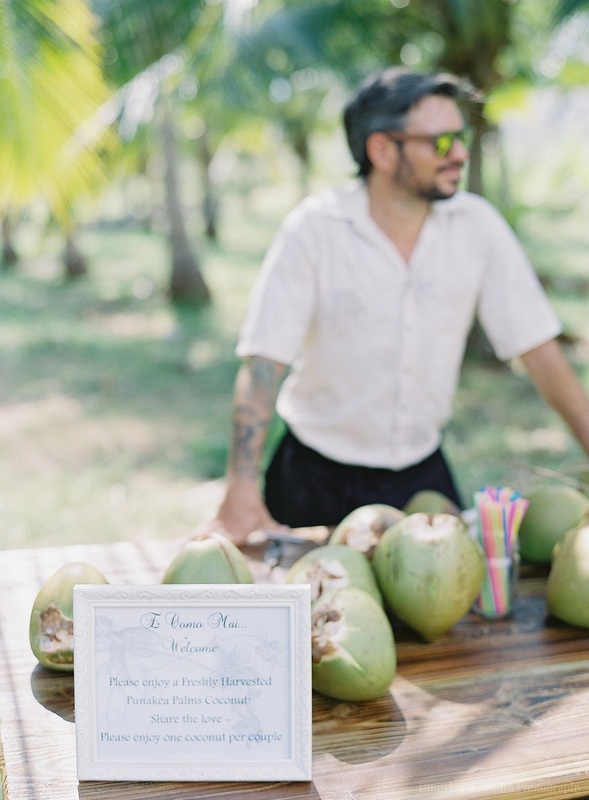 Katie and Joe had cool and frosty shave-ice treats, and a late night snack, on stand-by to recharge the revelers as they celebrated. 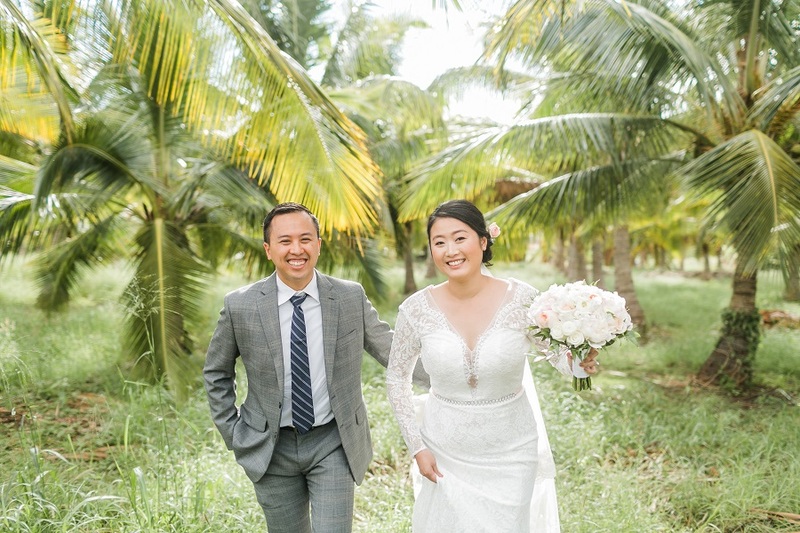 Erica and Dat made their way, hand in hand, through the coconut grove and into their future together. 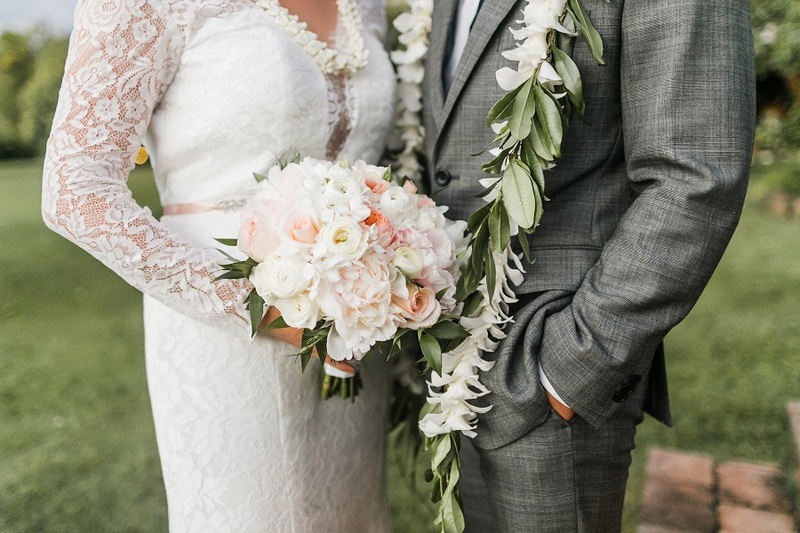 The couple experienced their own piece of Maui paradise, strolling through the lush coconut palms, and across the lawn to admire the expansive vistas where they shared their “I Dos.” Delicate peach-petaled roses and Eucalyptus leaves accentuated Erica’s gorgeous lace gown, which hearkened back to 20’s-era glamour. 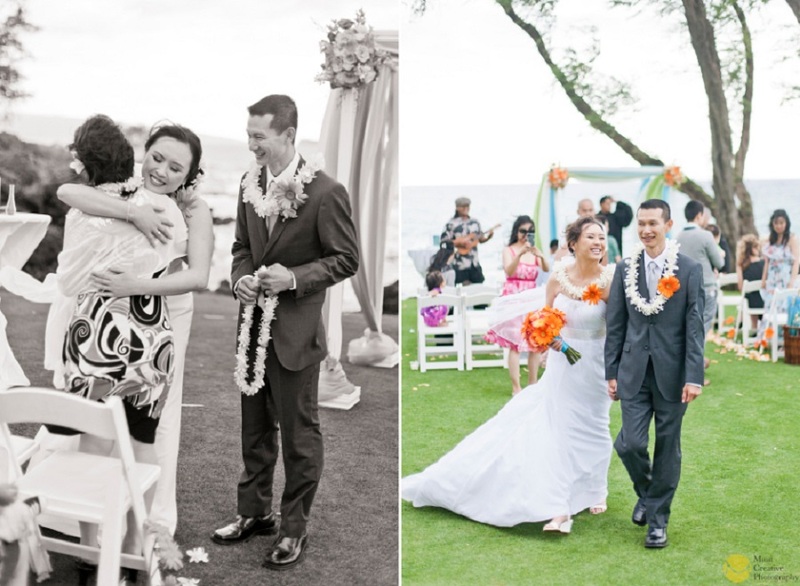 Both were adorned with floral leis, as beautiful as their beaming smiles! 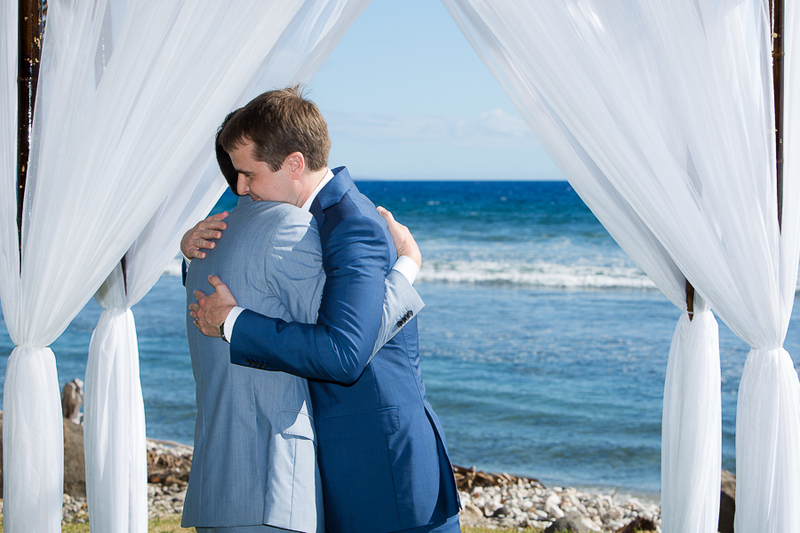 Wedding Planner Cherise Schulman was especially excited to greet two of the guests at Erica and Dat’s wedding with a big hug…she had been their wedding planner in 2013! 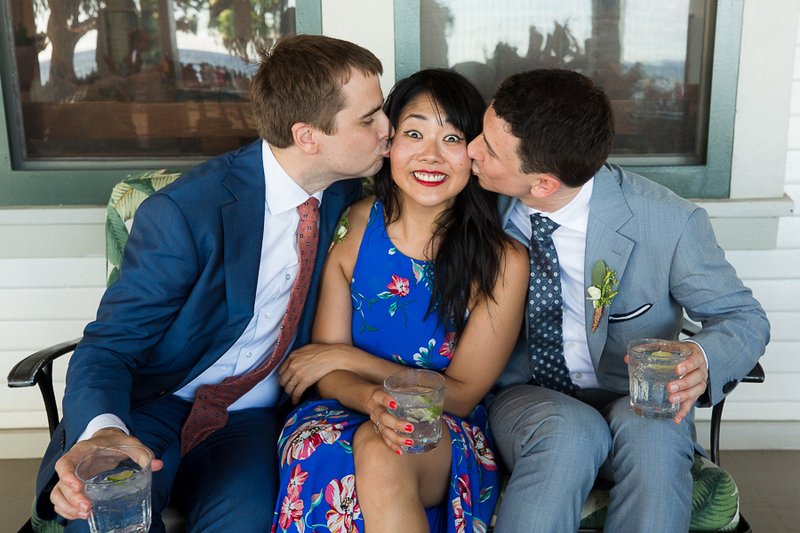 Dat’s sister, Chi, and husband Alex were in attendance, which made the day extra special. 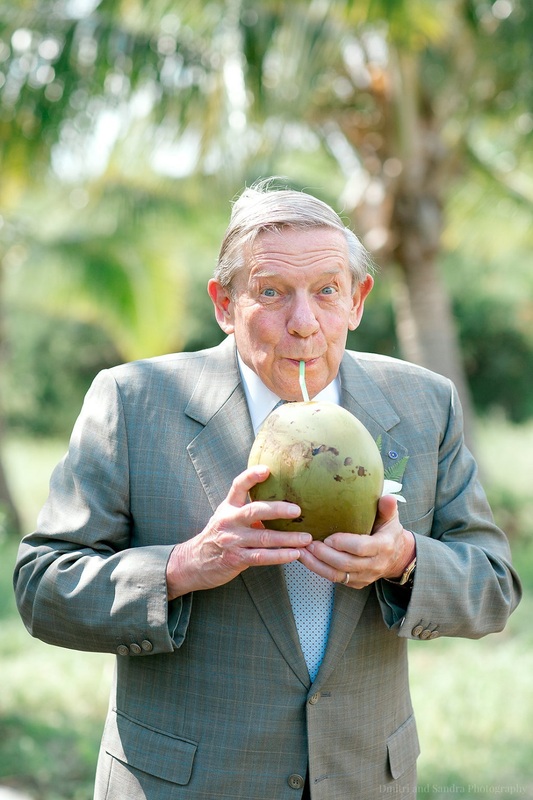 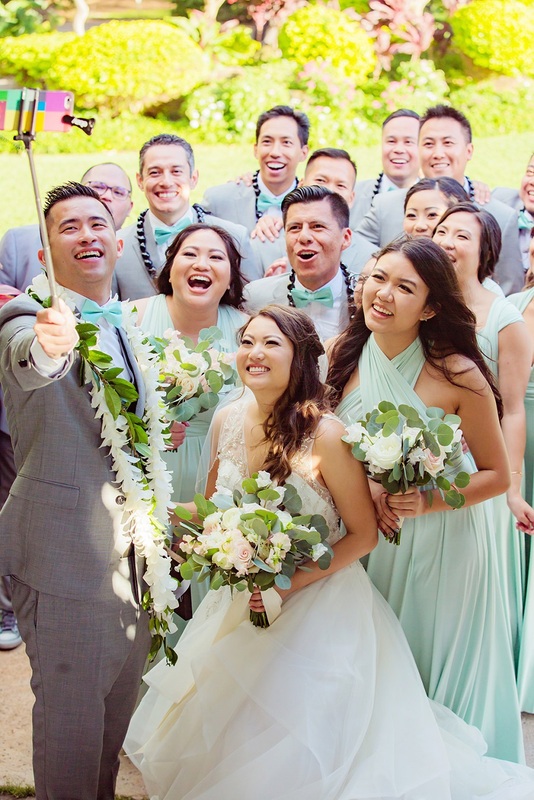 Here is a throwback the Chi and Alex’s wedding in 2013! 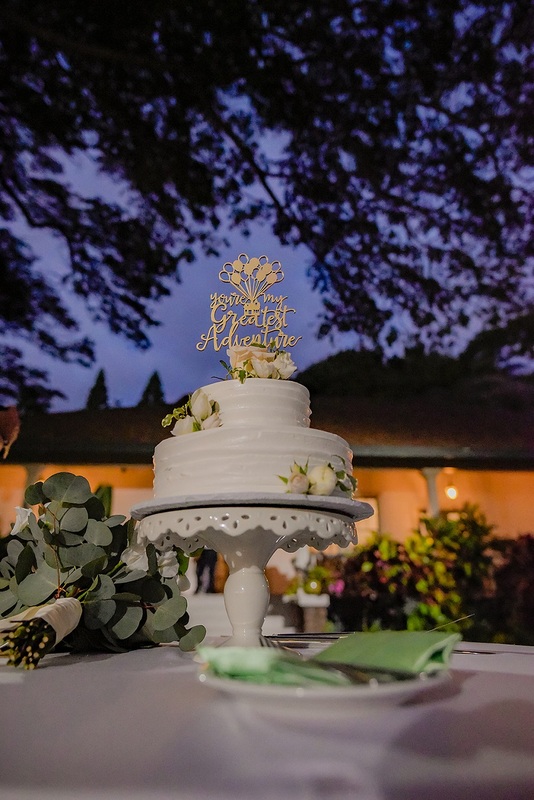 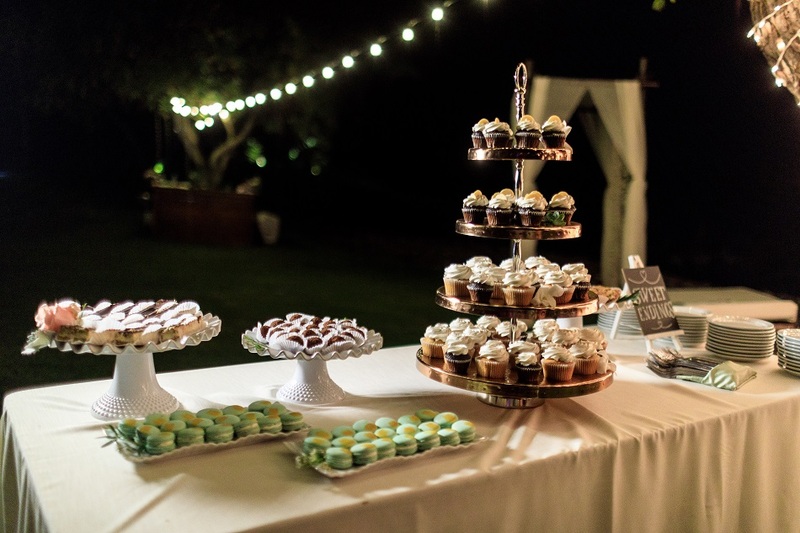 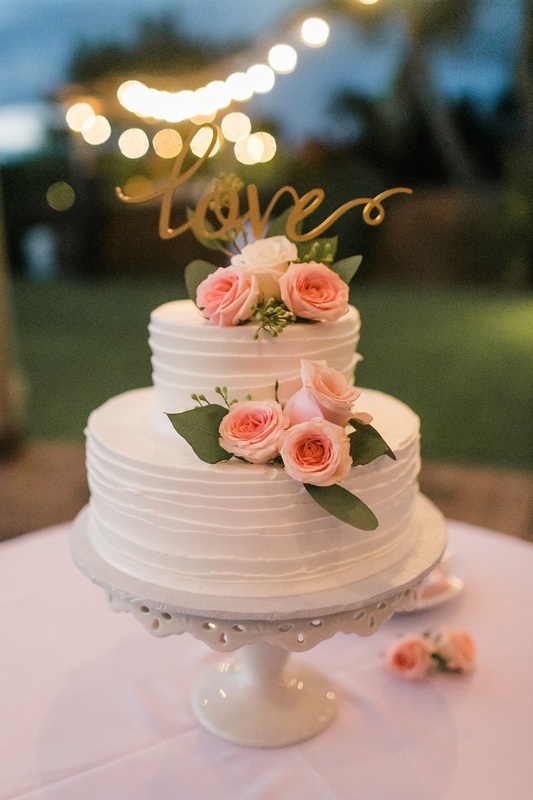 Wedding Cake: Maui Wedding Cakes, Inc.
What could be better than marrying your best friend? 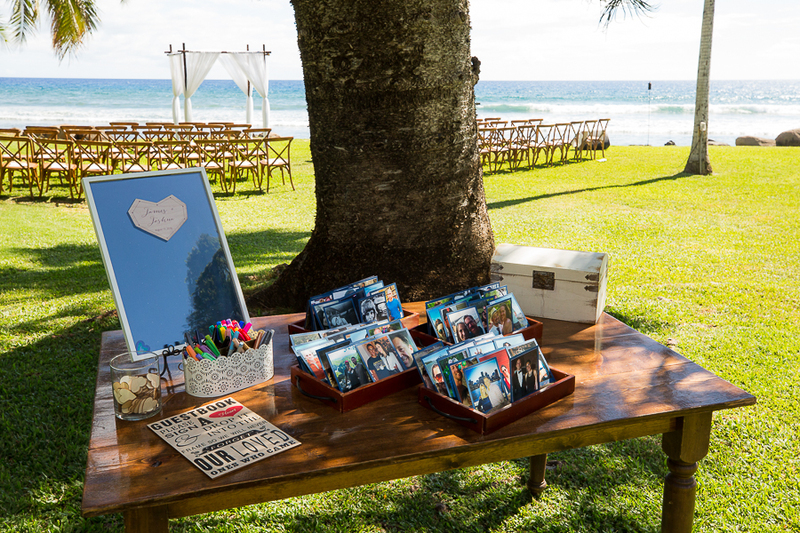 Having that wedding at a beautiful estate in a sun-soaked paradise! 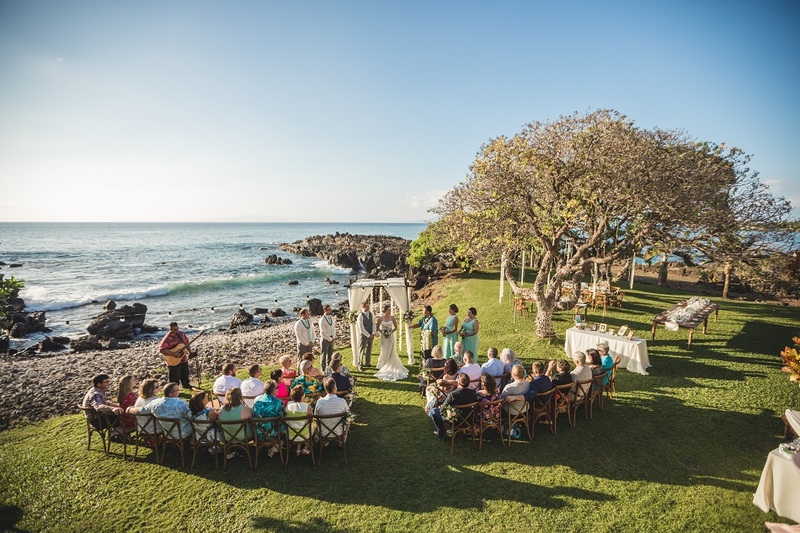 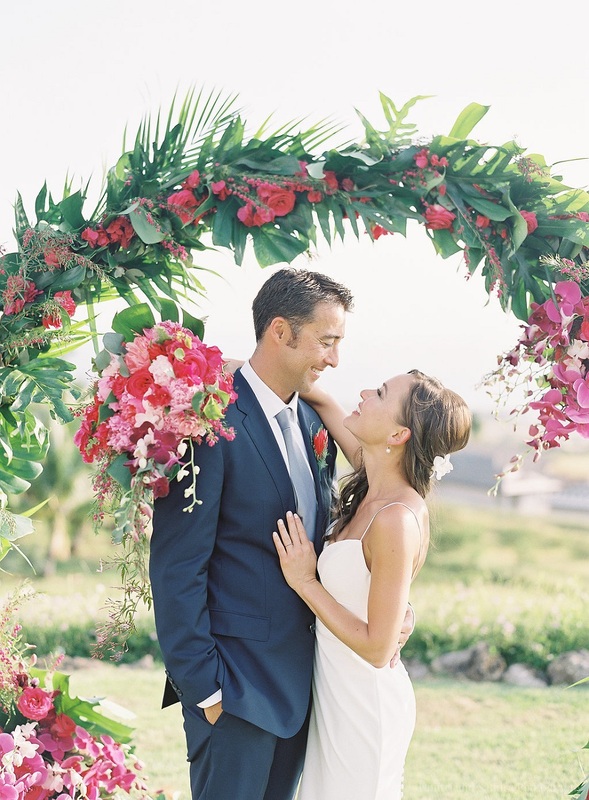 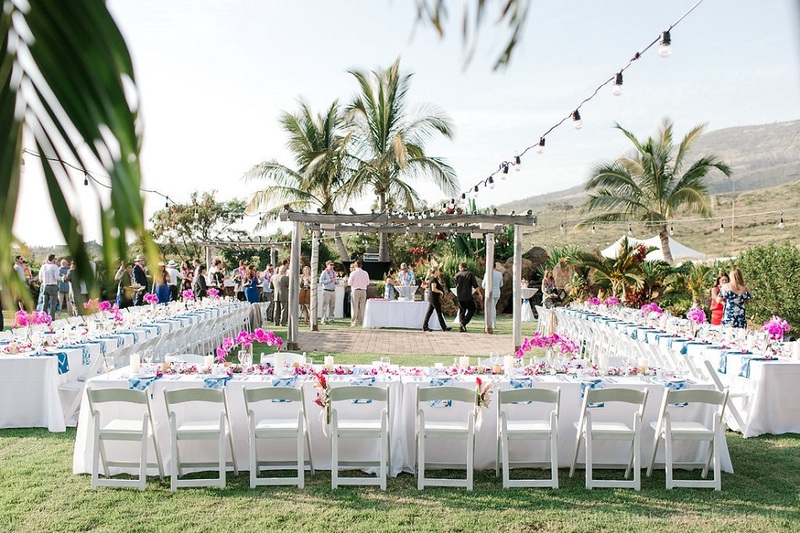 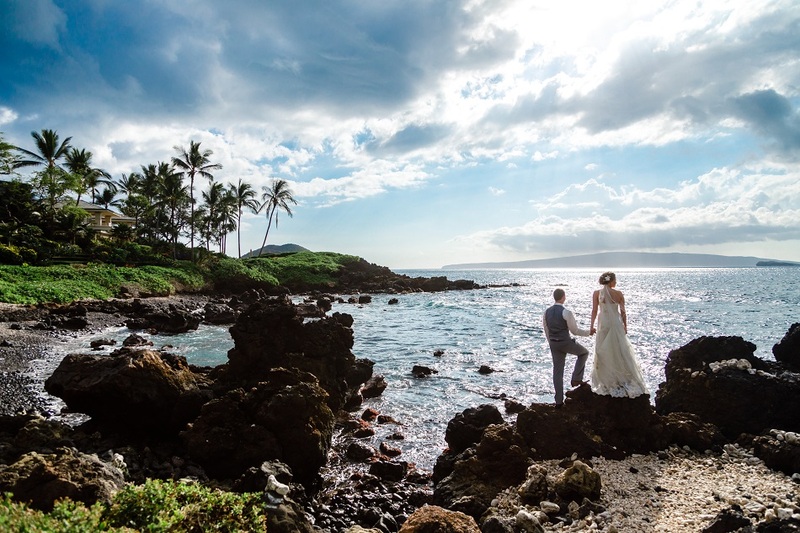 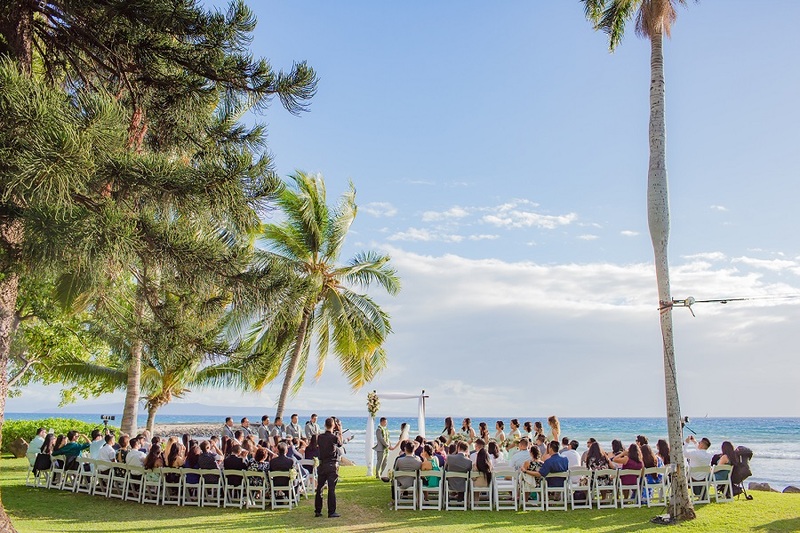 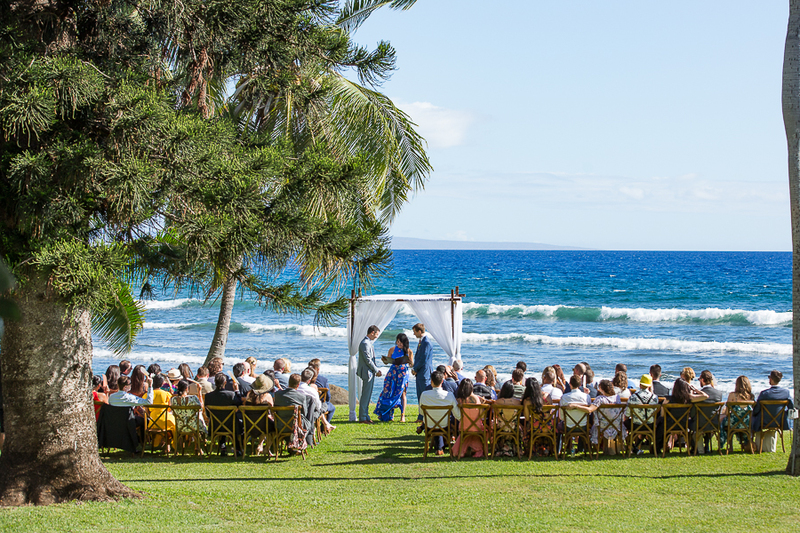 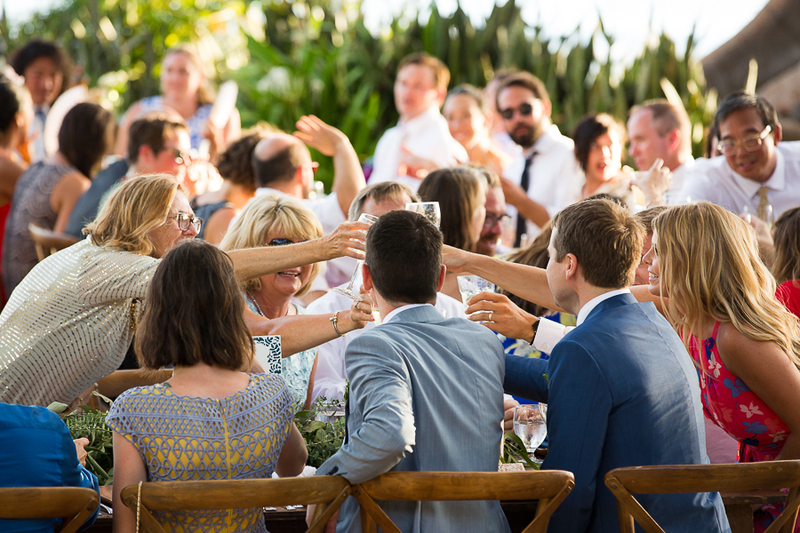 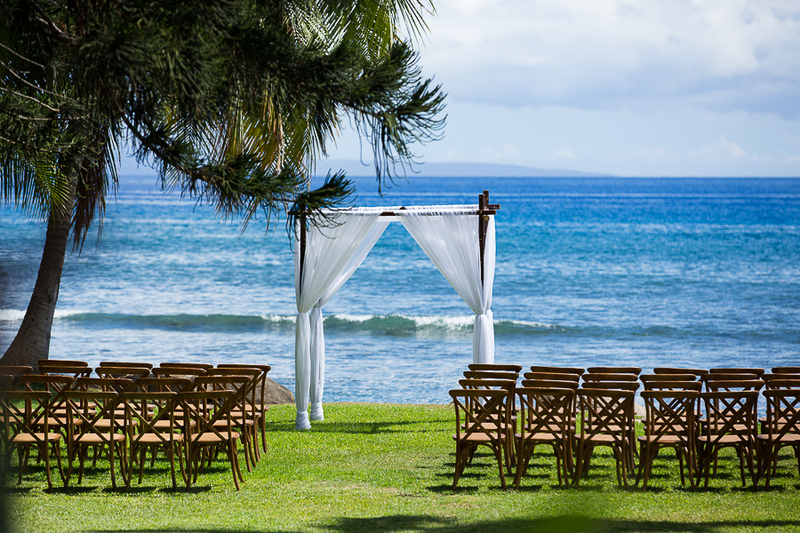 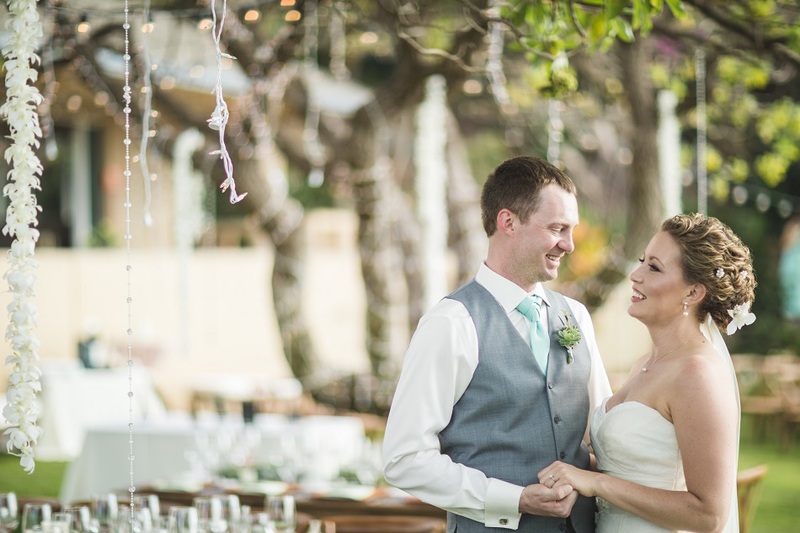 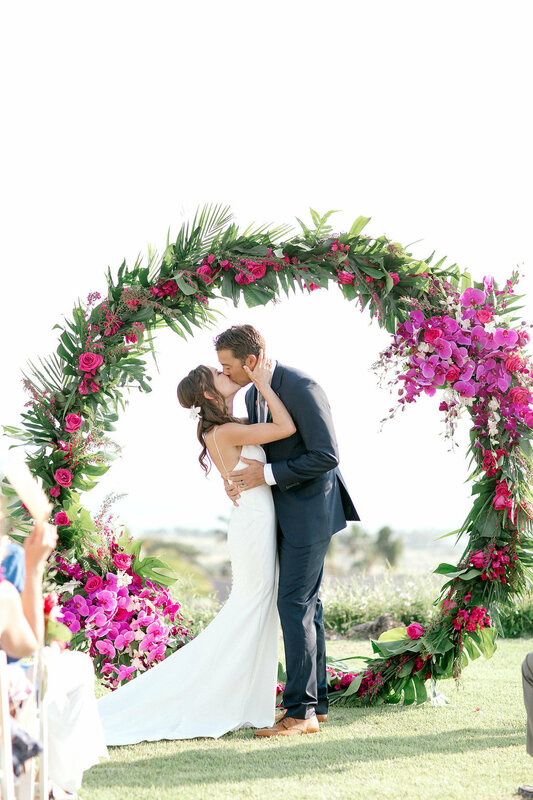 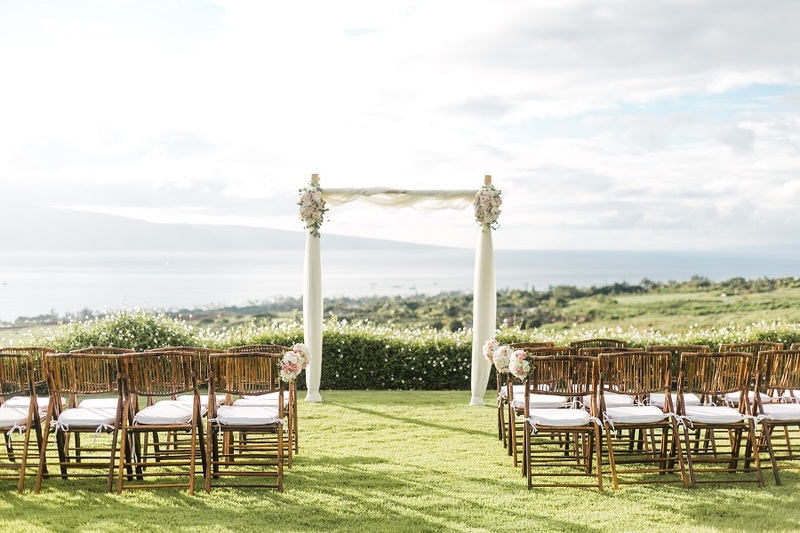 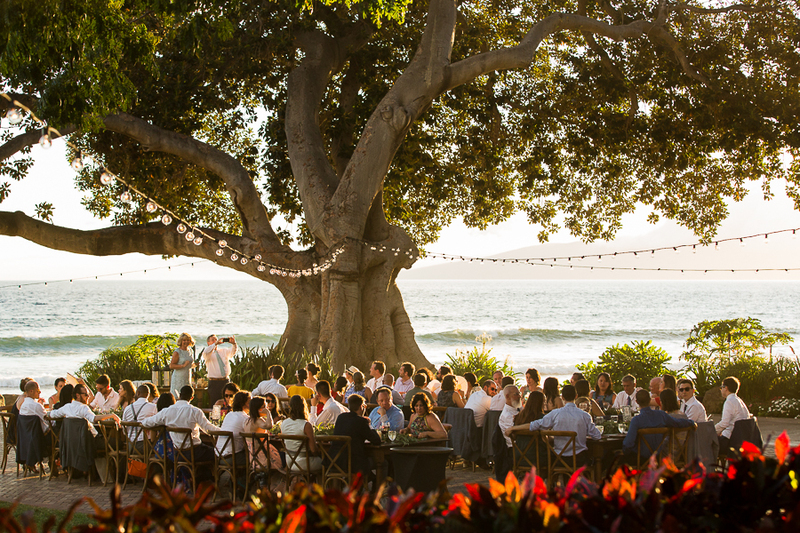 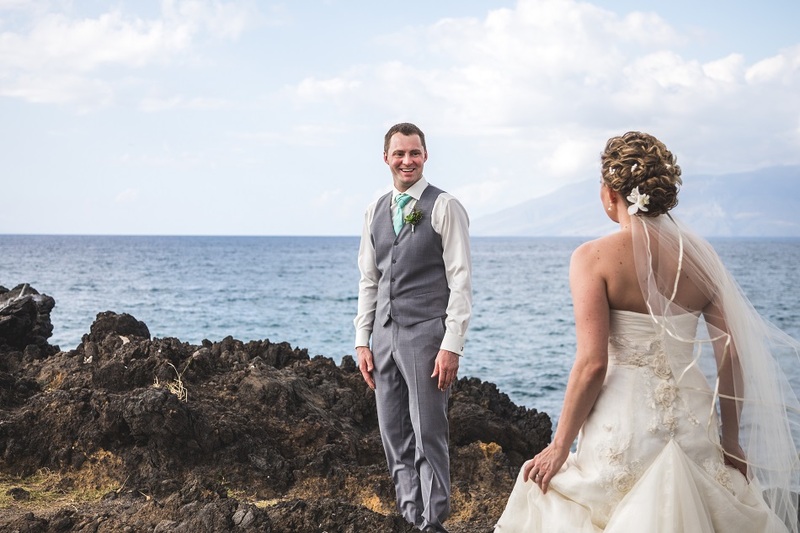 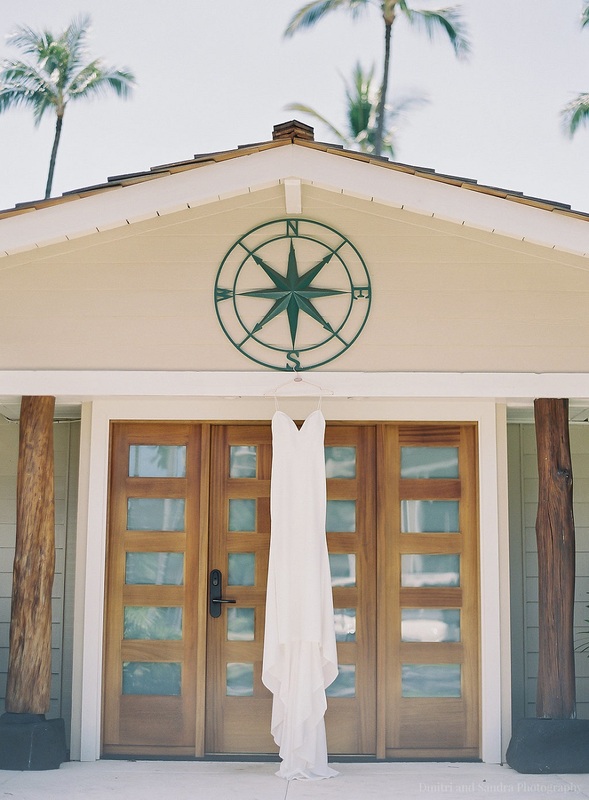 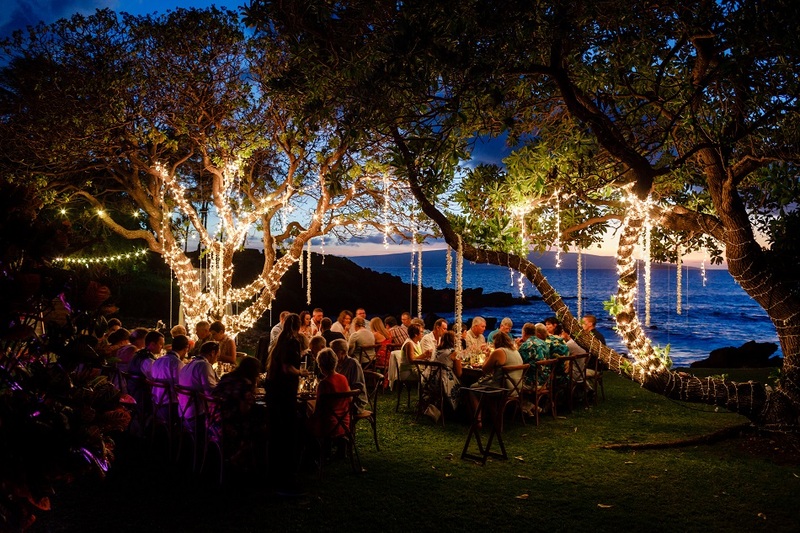 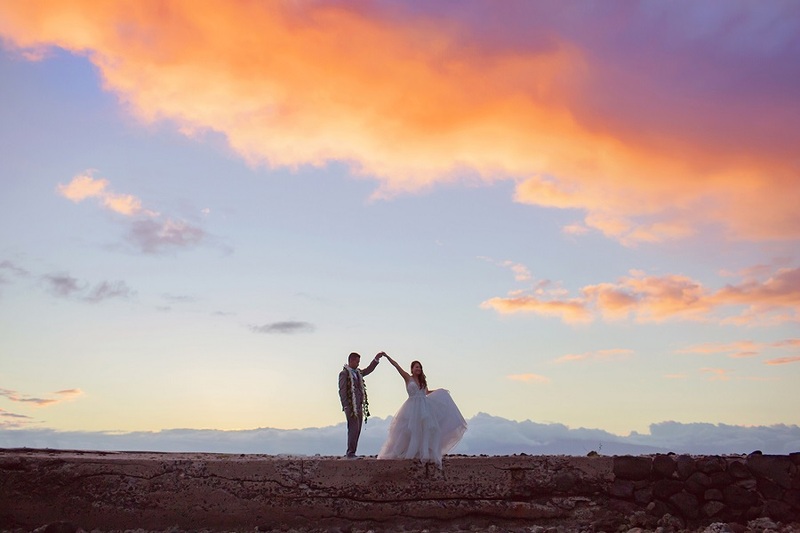 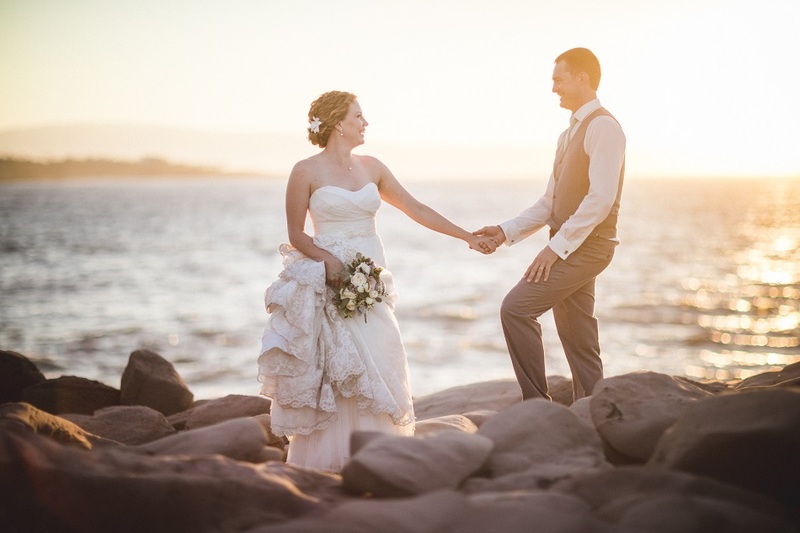 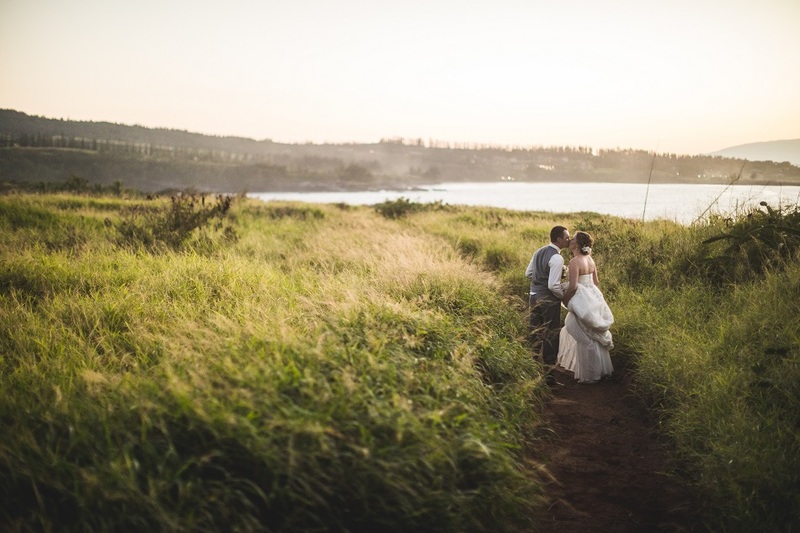 Leslie and Tanner’s gorgeous seaside wedding was held on the South shore of Maui in Makena. 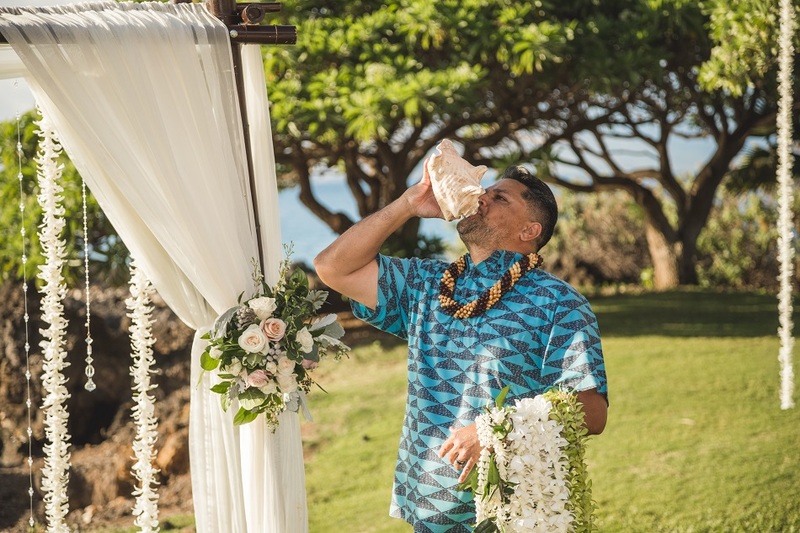 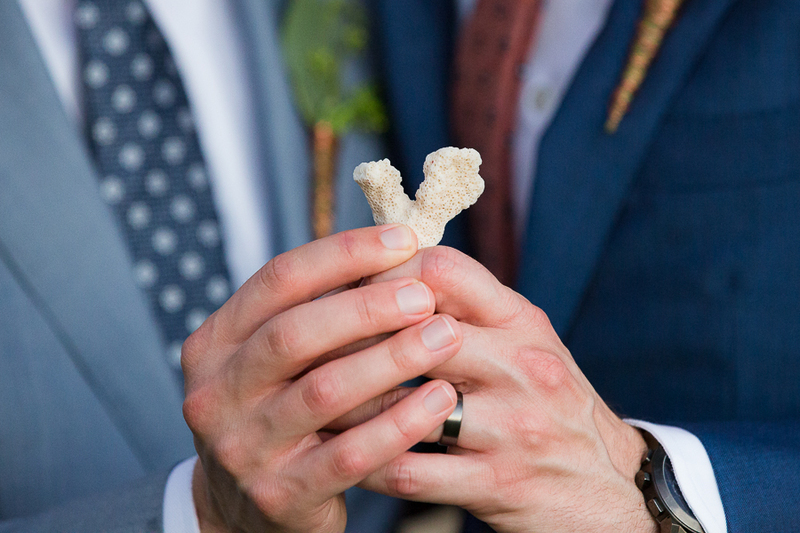 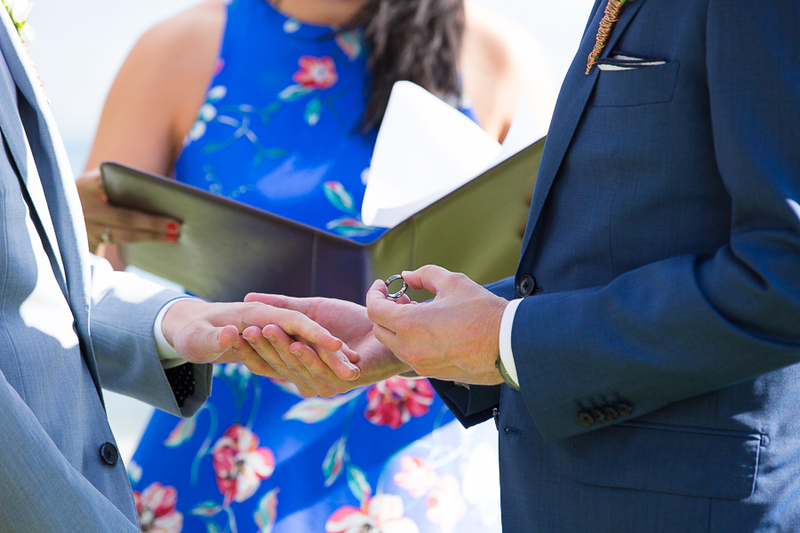 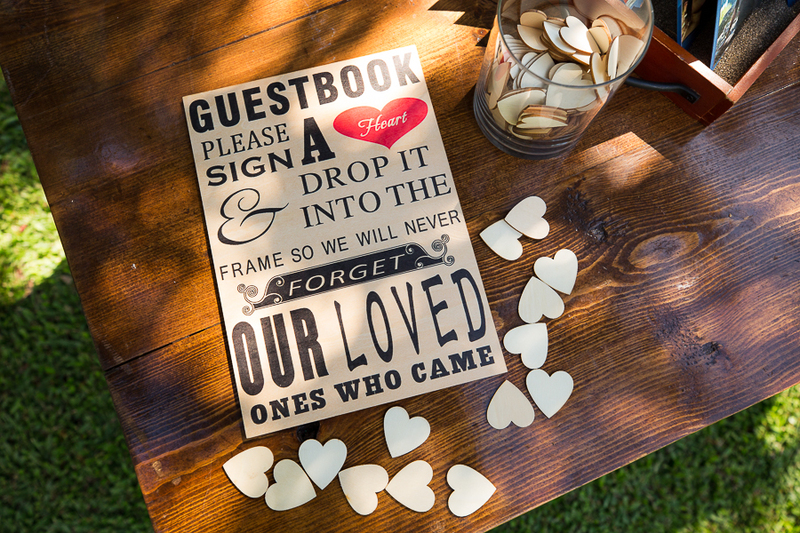 Family and friends gathered on the sun-speckled lawn to watch as the conch shell sounded, marking the beginning of their forever. 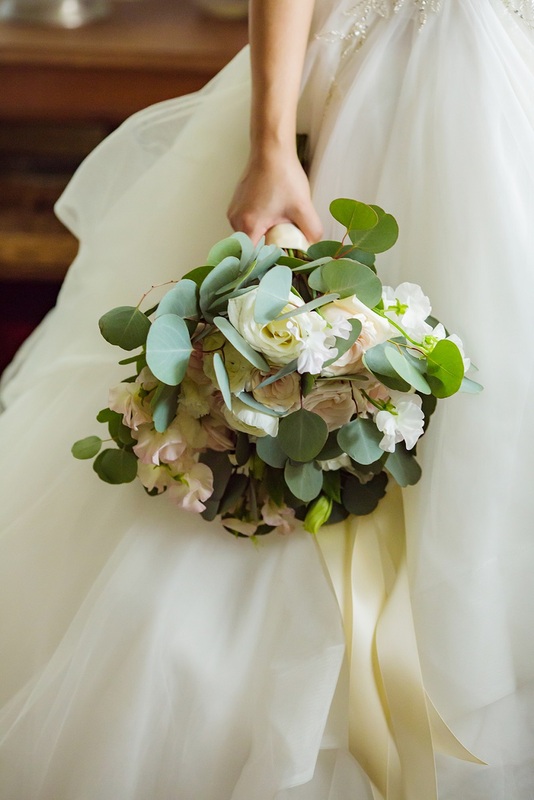 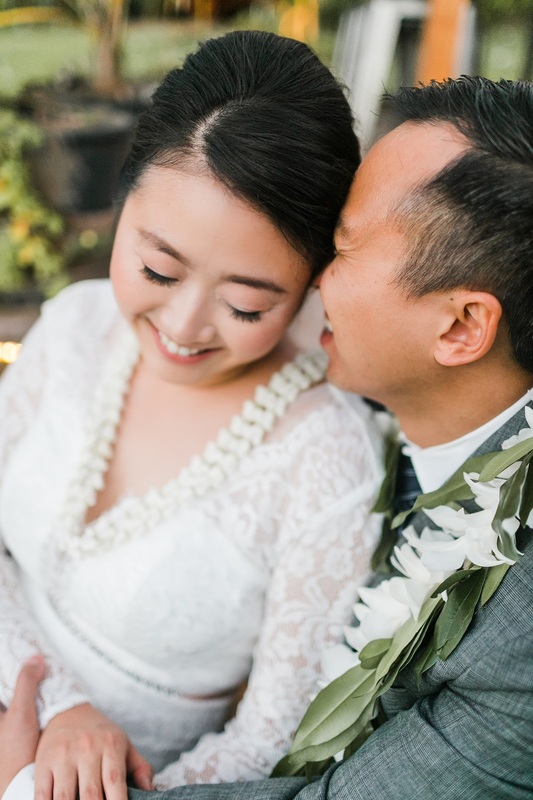 The wedding took on a whimsical feel, with trees draped in twinkle lights and long strands of orchids, which created a fairy tale feel for the bride, groom, and their guests to enjoy. 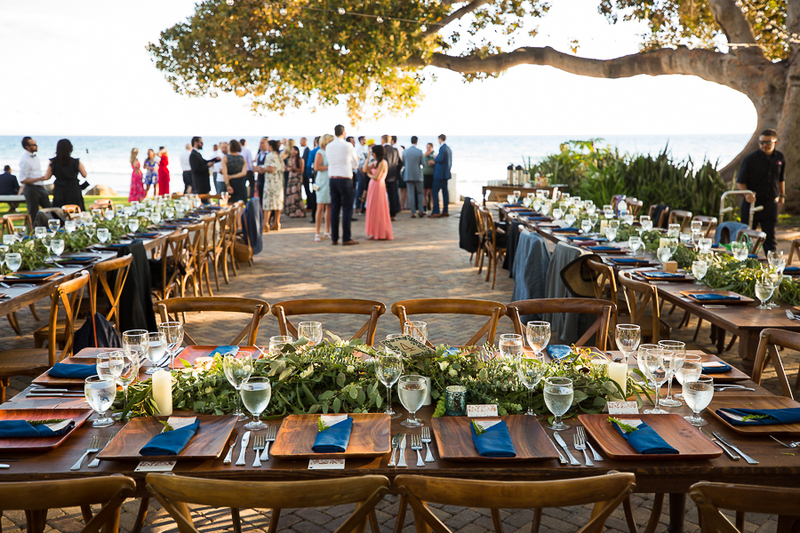 Rustic tables invited the party to dine next to the crashing waves along the private, white-coral beach. 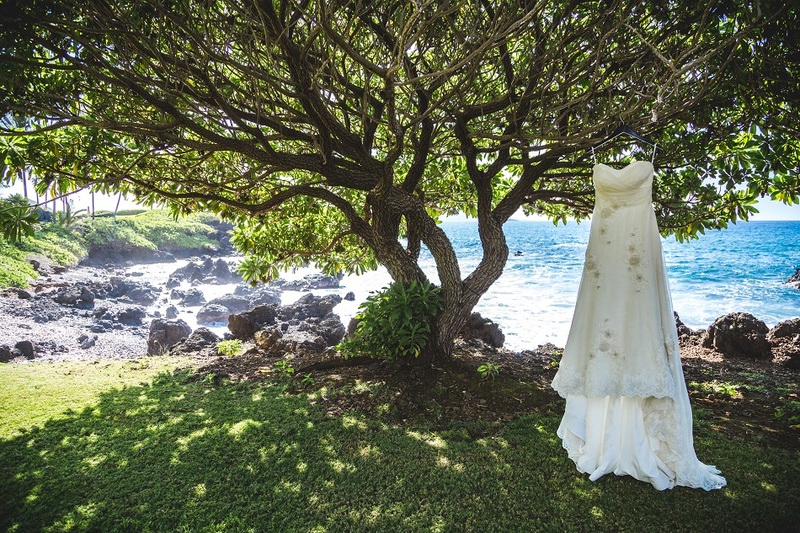 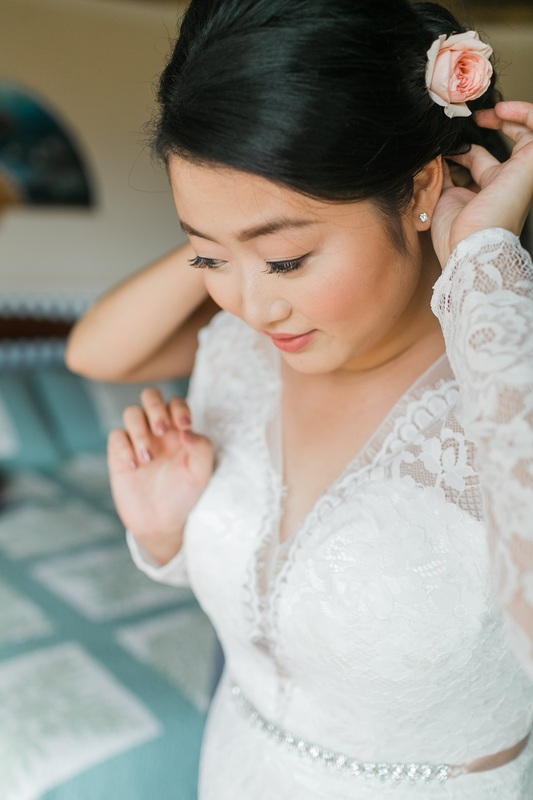 The surrounding lava rocks provided a stunning backdrop for photos, with their sharp black edges contrasting beautifully with the delicate lace detail on Leslie’s wedding gown. 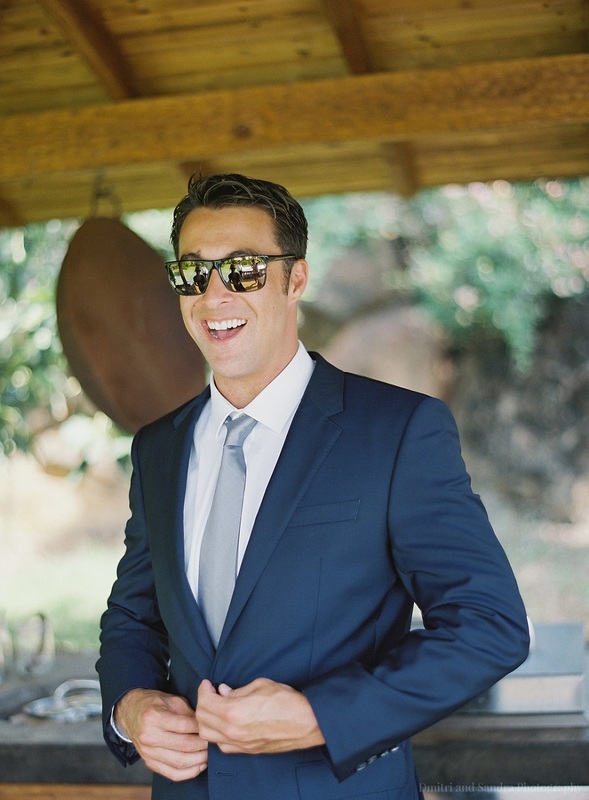 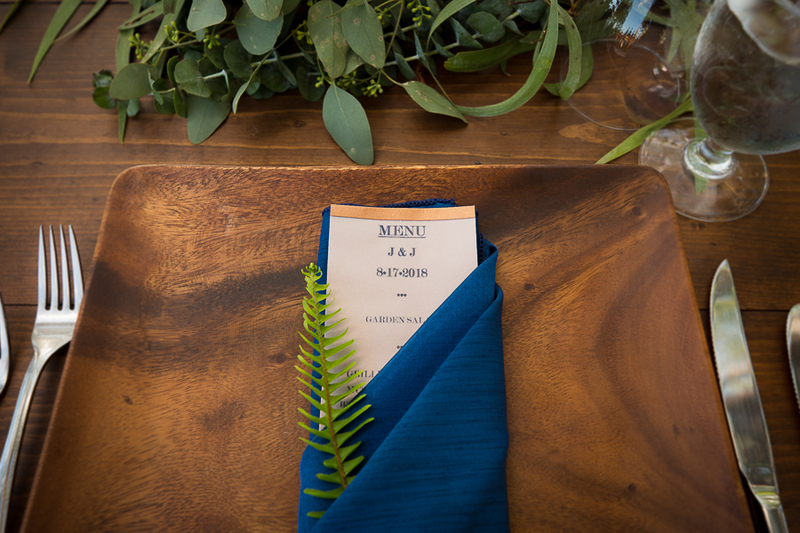 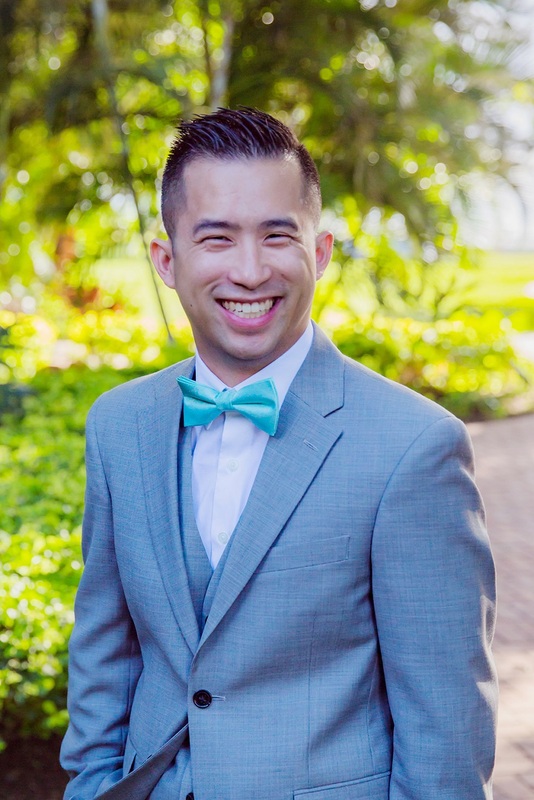 Ocean-blue accents were carried throughout the wedding, from the groom’s tie all the way down to the delicious macaroons served under the stars! 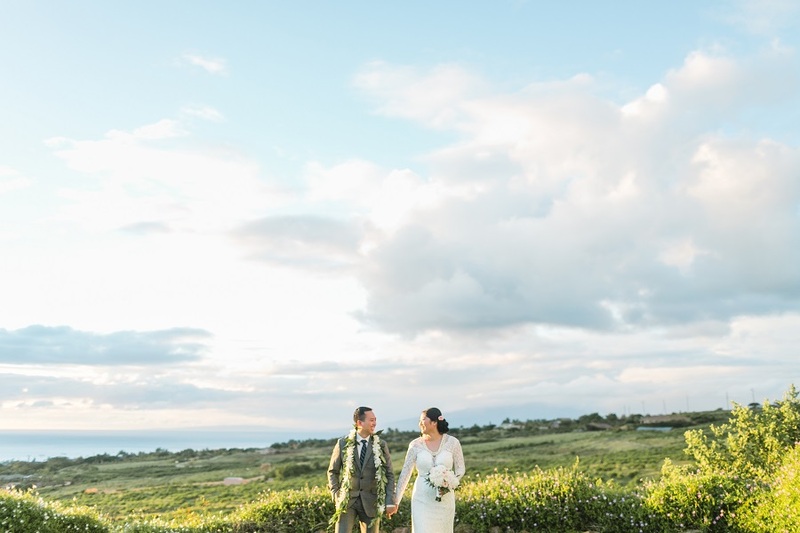 Leslie and Tanner ventured off-property to capture more of Maui’s verdant beauty in their rain forest photo shoot with family friend, Chugach Peaks Photography. 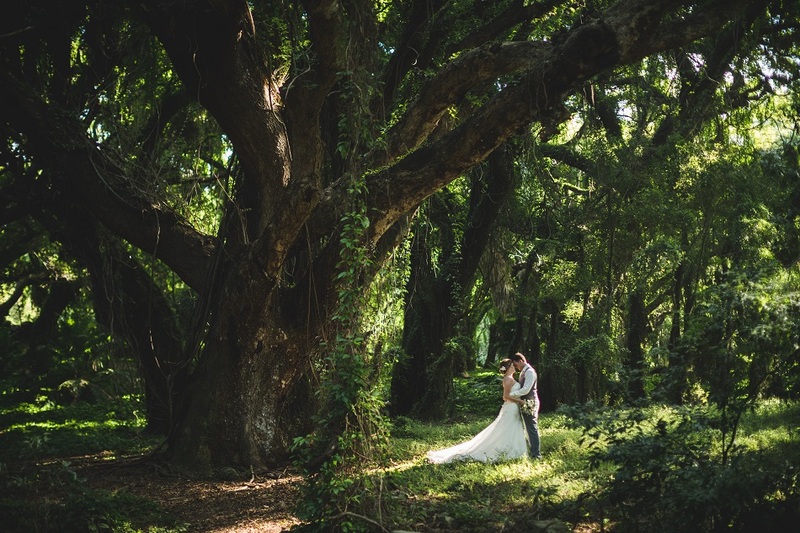 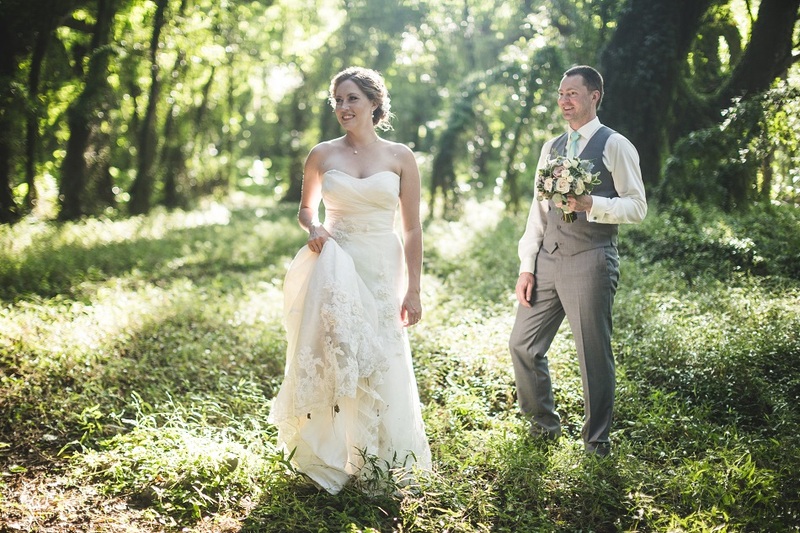 Towering trees draped in lush vines surround the couple in natural beauty, and the golden light casts an ethereal glow on this happy couple. 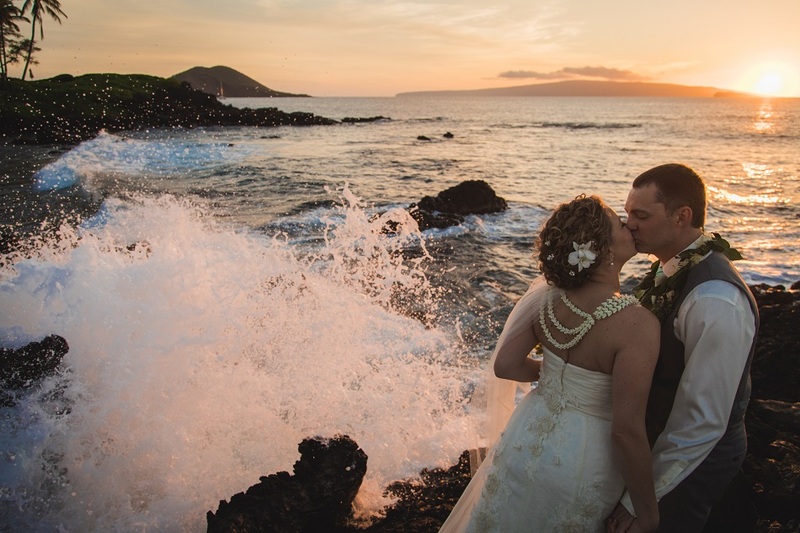 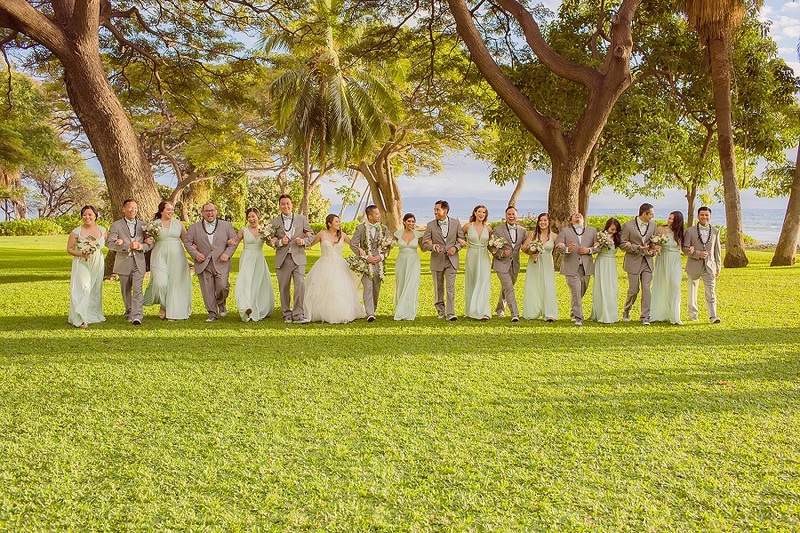 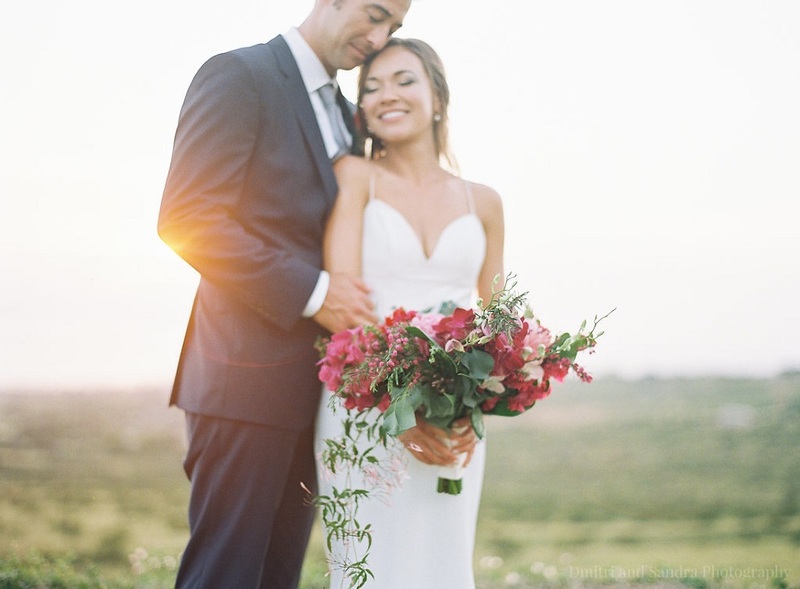 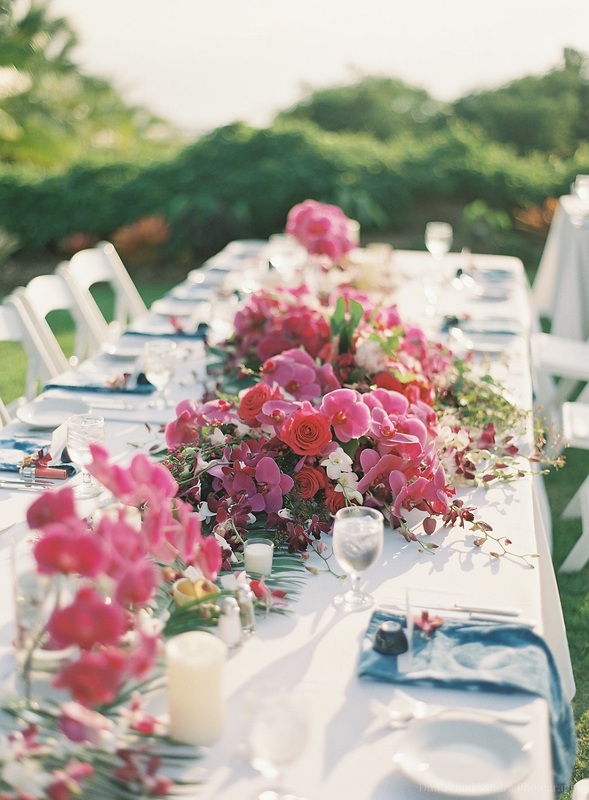 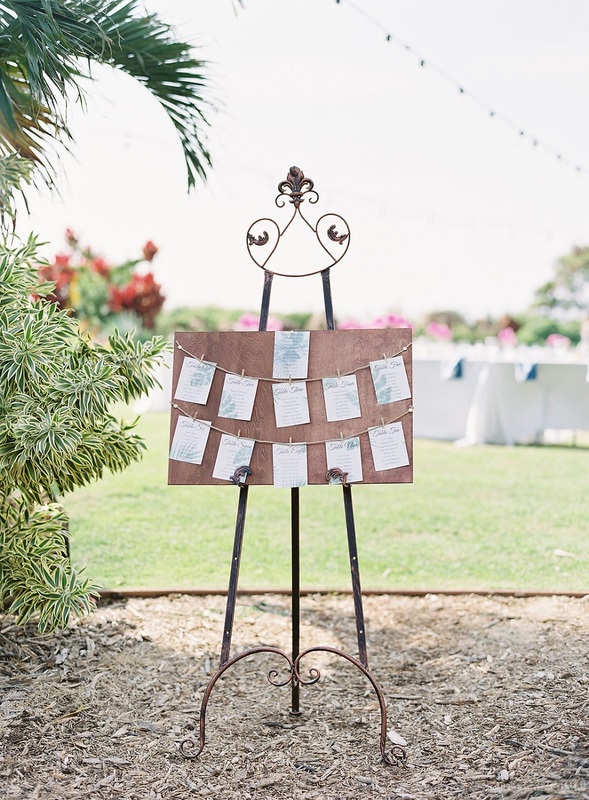 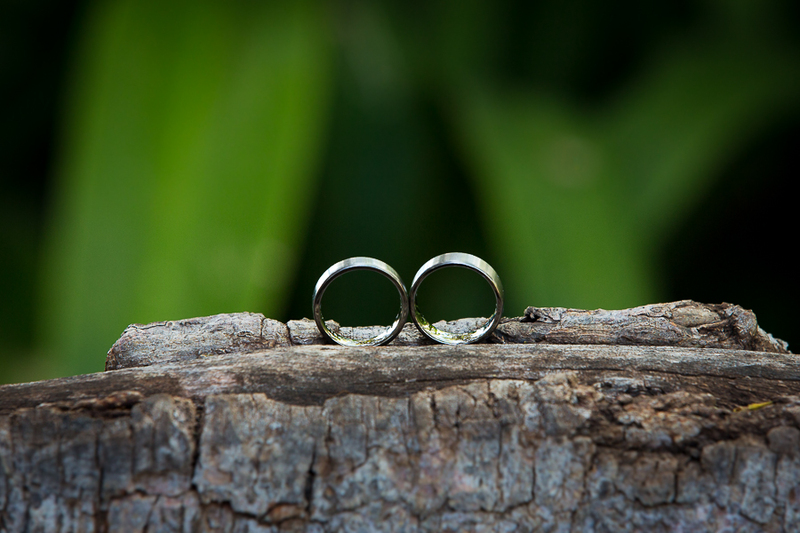 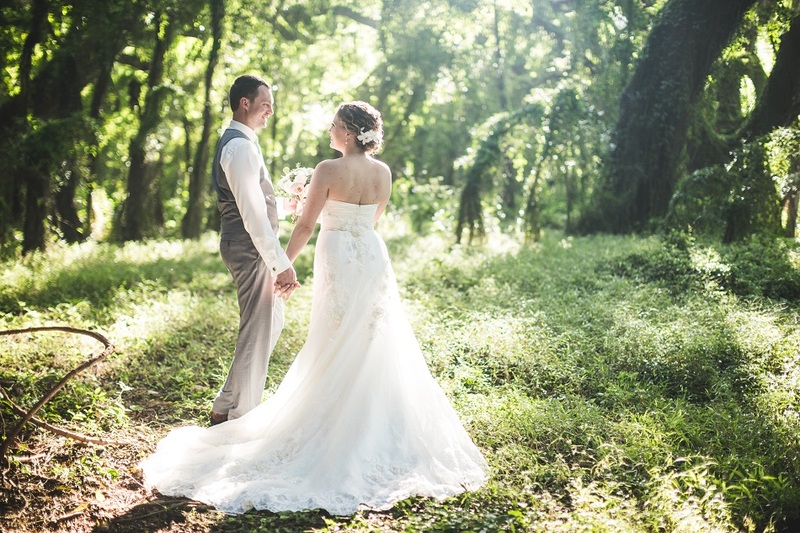 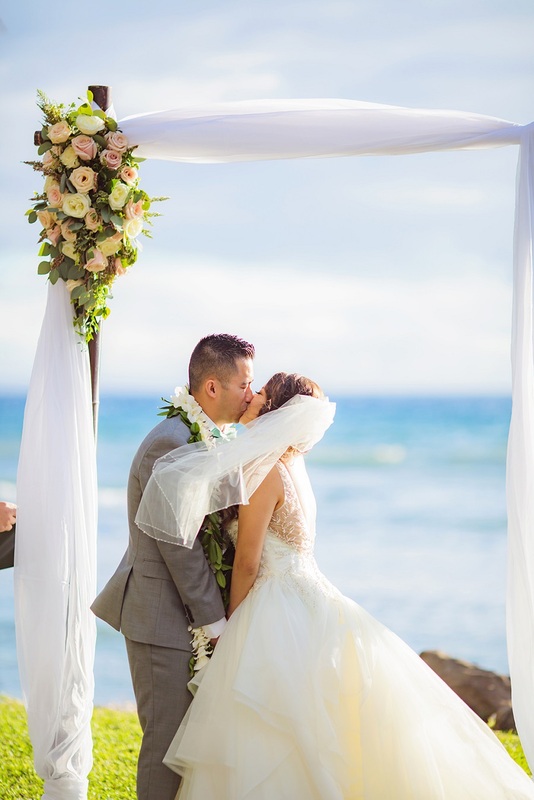 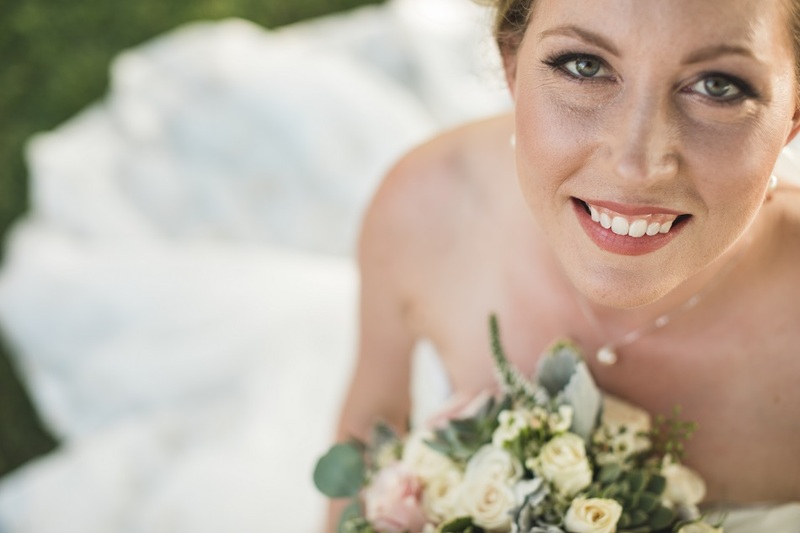 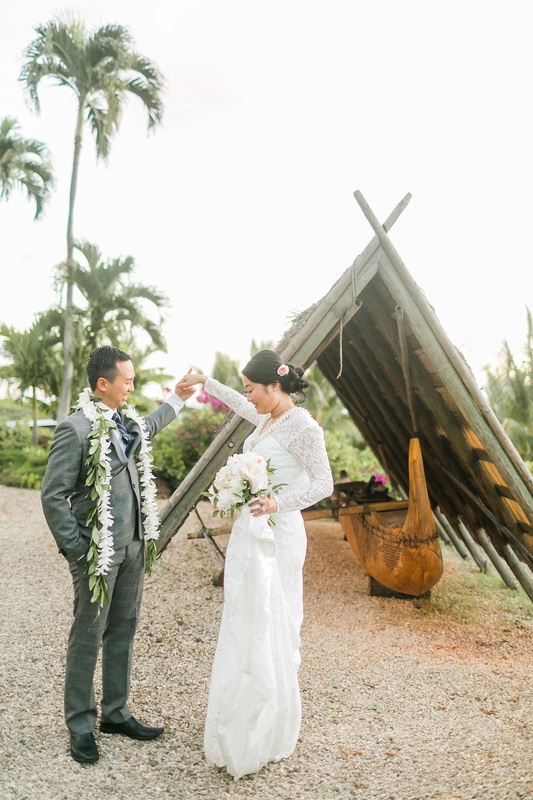 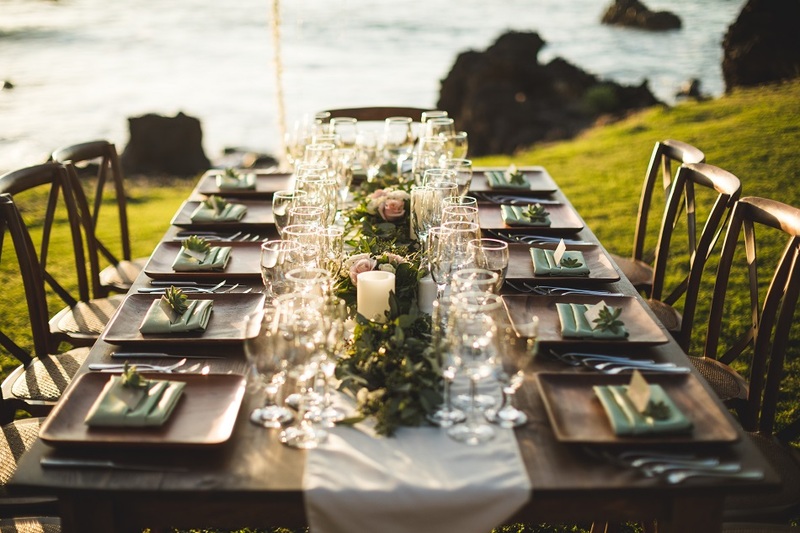 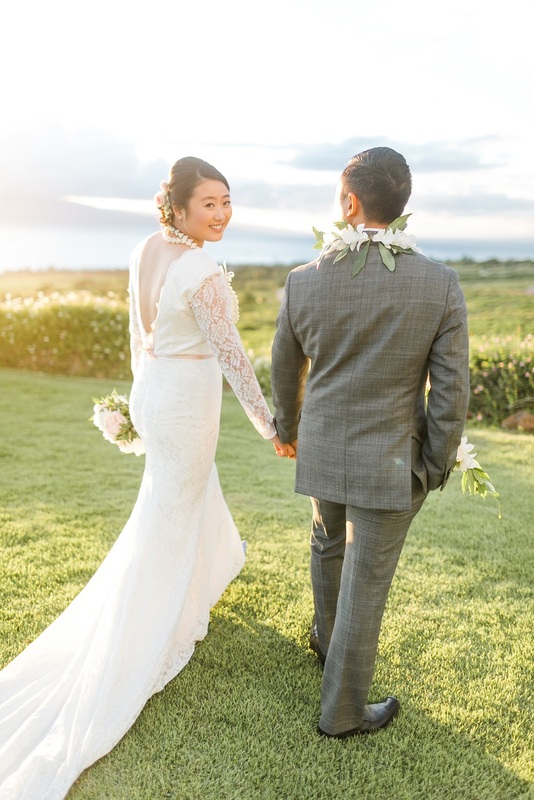 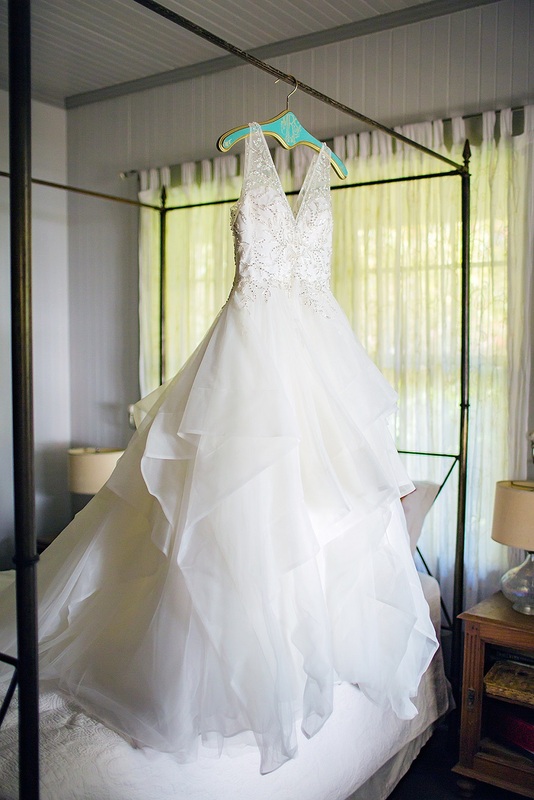 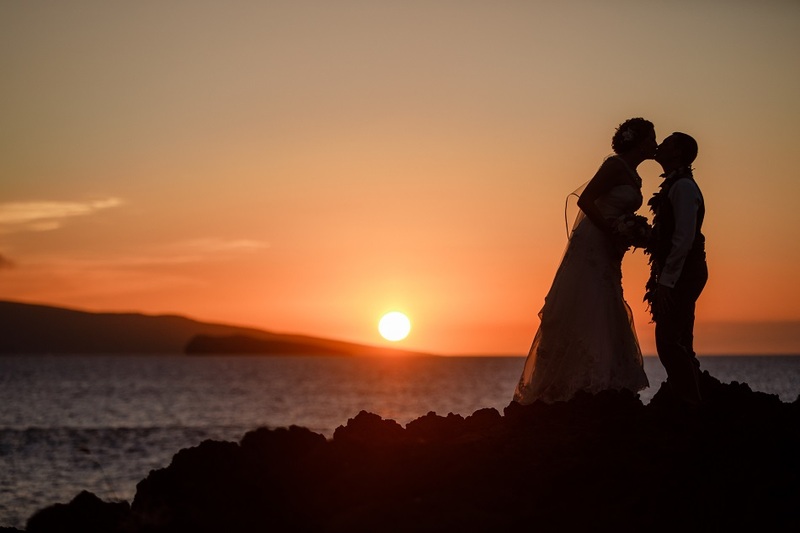 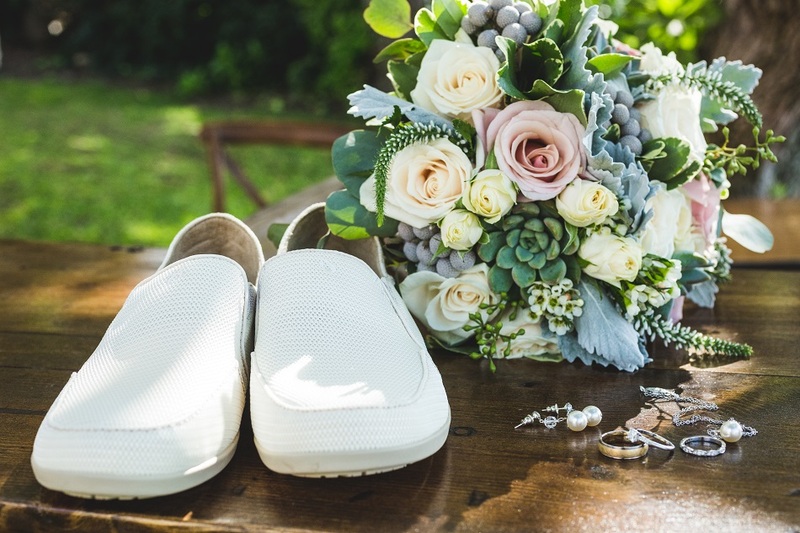 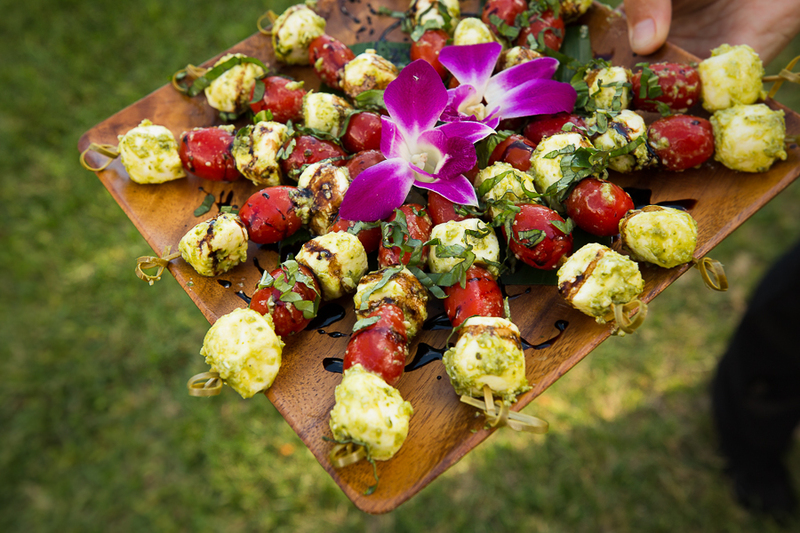 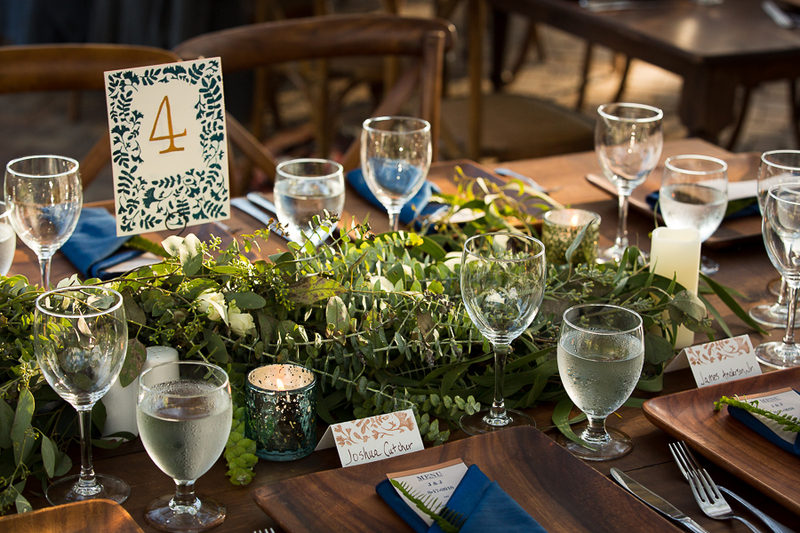 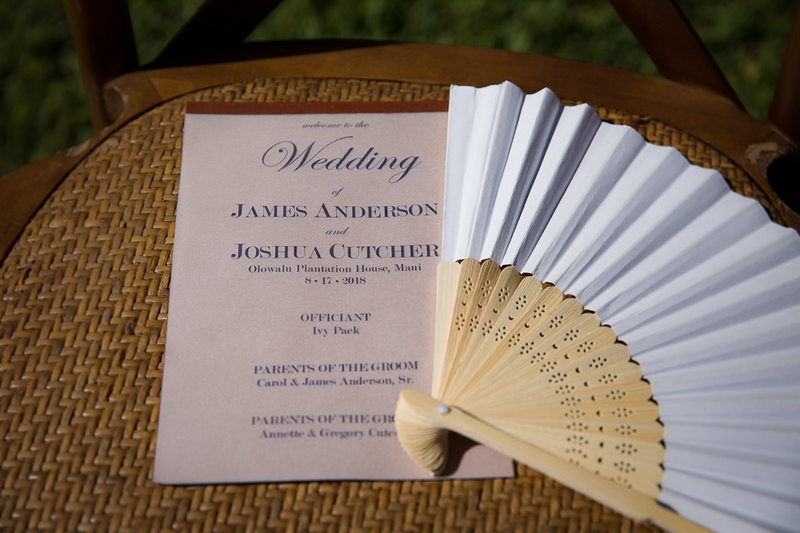 We are so happy to have been a part of their gorgeous Maui wedding! 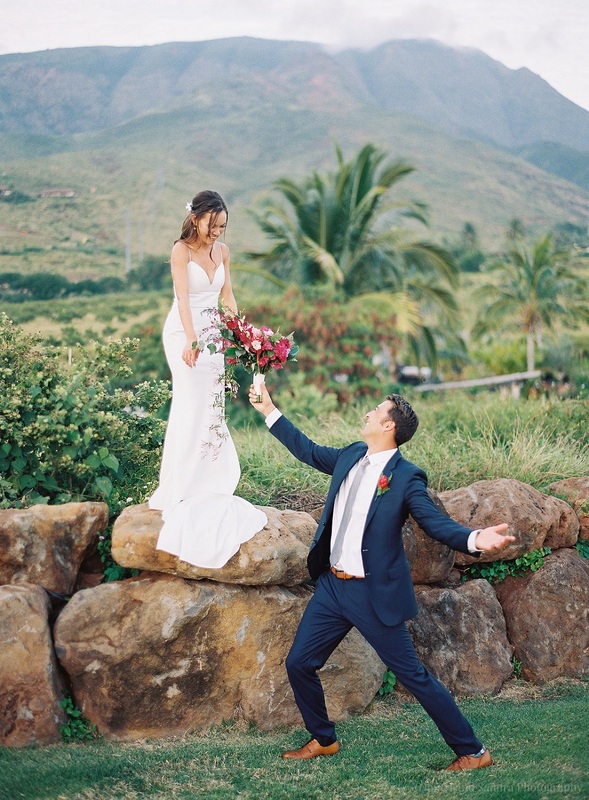 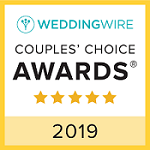 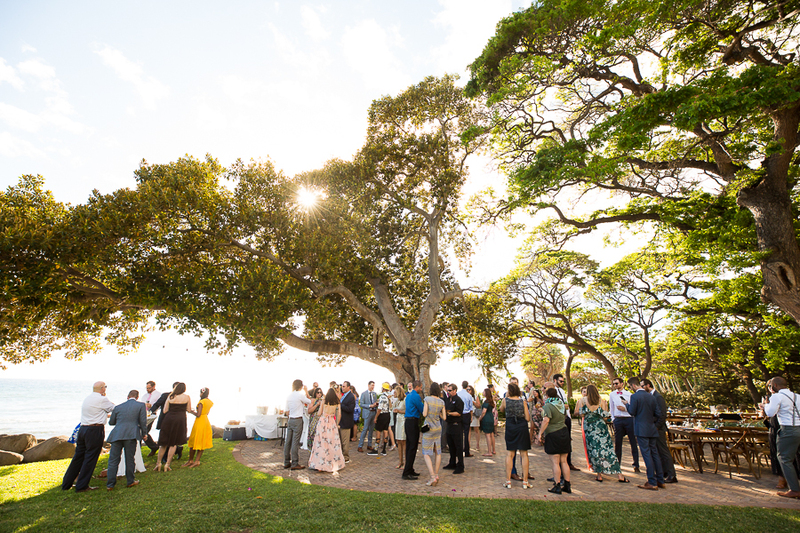 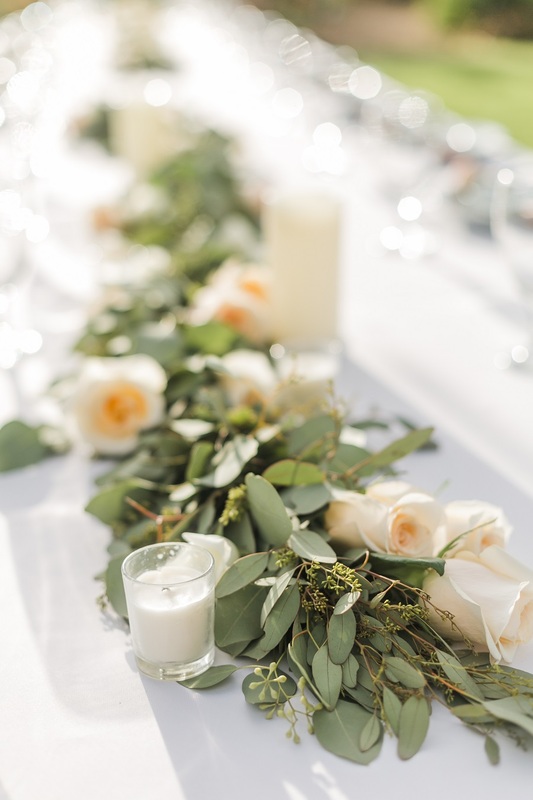 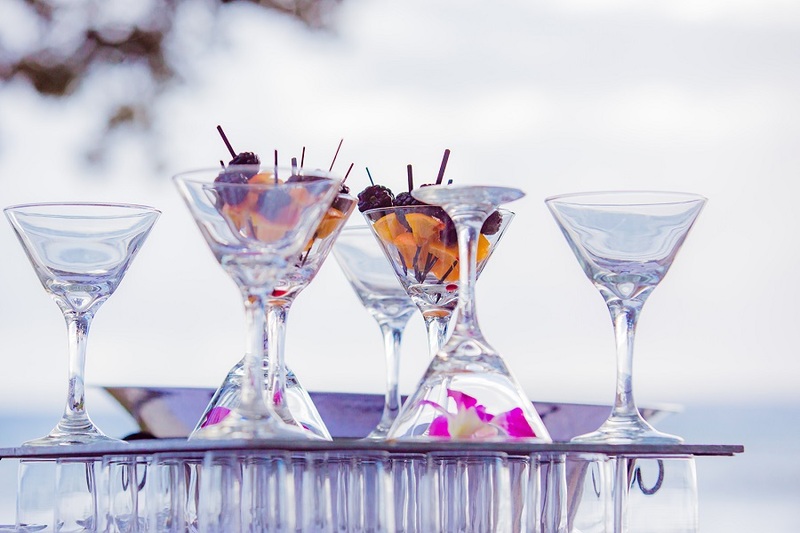 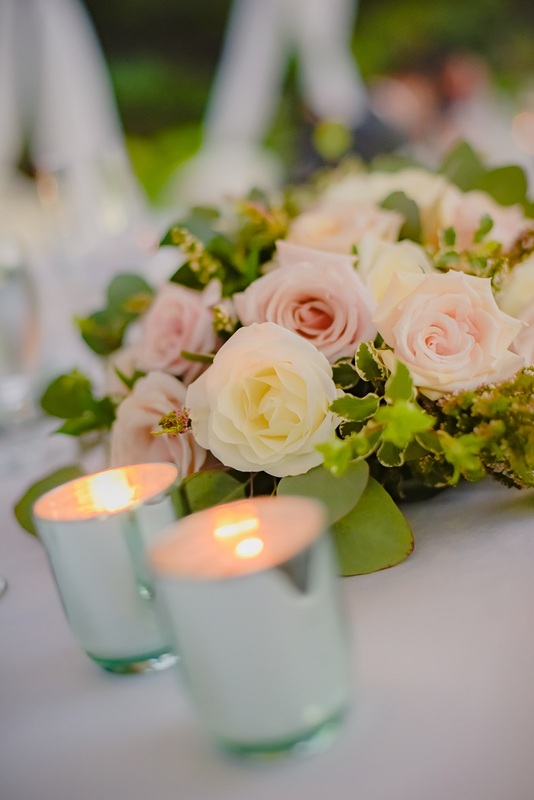 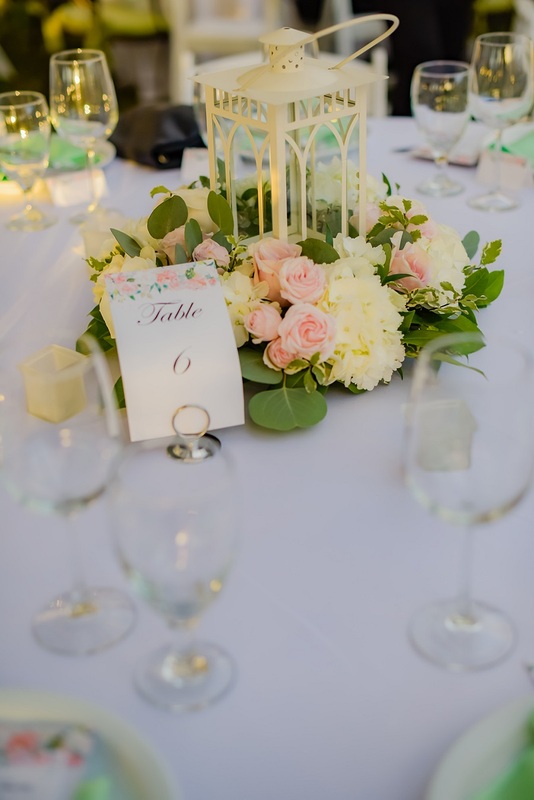 A special “Thank You” to all of the vendors who helped to make this wedding so spectacular: Valentino Rosete, Kahiau Wedding Flowers, Food for the Soul Catering, Paradise Event Rentals, Joshua Kahula Music, Chugach Peaks Photography, and Beach Bunny Bakery.